Tuesday, January 20: Our overnight train to Jishou, in Hunan province, doesn’t leave until 5:20 p.m. so we have a leisurely morning in my shabby Nanning apartment, where I serve up scrambled eggs with cheese and coffee, made with the fabulous 3-in-1 coffee packets that are my mainstay here in China. Black coffee: forget it. It doesn’t exist except out of a Nescafe jar. 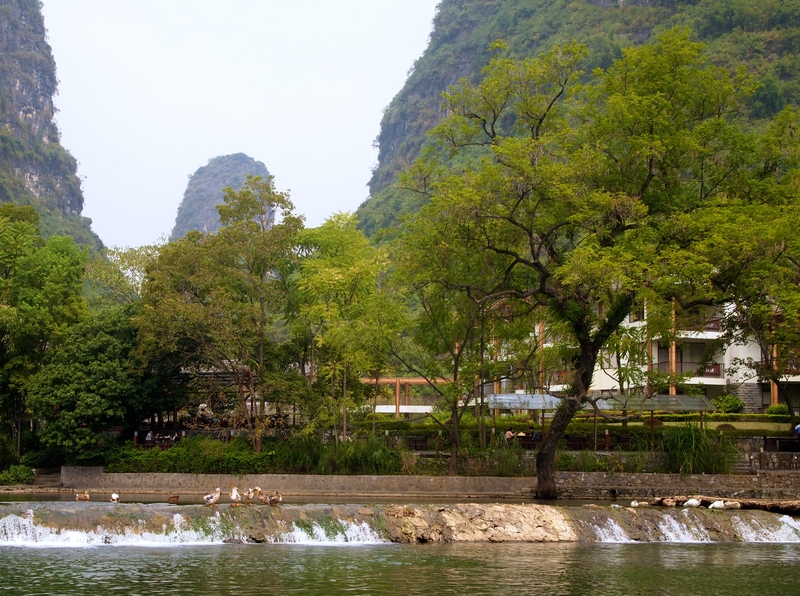 In the late morning, I take Mike out for a walk around the Guangxi University campus, through the West and the East campuses and the Agricultural College. It’s about a 4 mile walk all around. Mike’s amazed by the huge athletic field with its multitudes of basketball hoops and nice track. We talk about how the Chinese love basketball, along with table tennis and badminton. He also wonders about all the elderly people who live in decrepit buildings on the campus. The campus is surrounded entirely by a wall and it’s said thousands of people live on the grounds (I’ve heard estimates of 20,000 but I have no idea if that’s correct). It seems the campus just plopped itself down in the middle of old neighborhoods during its 1928 establishment. Or maybe the elderly residents were once graduates of the university! I would love to know the history of this. I still have to finish packing, so, as the weather forecast is calling for cold and rain in Hunan Province, I figure layers are the key. 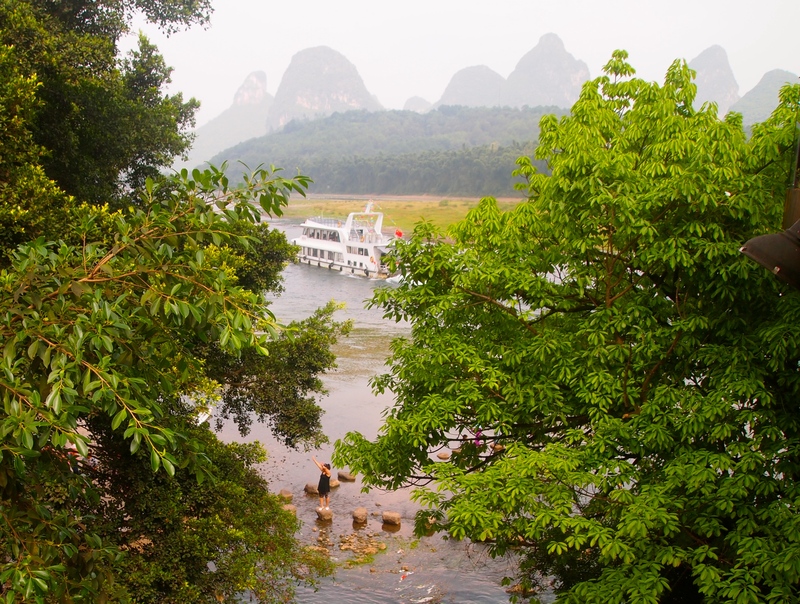 The forecast is for incessant rain in Zhangjiajie, but the temps are expected to be in the 50s and 60s Fahrenheit. I do pack one blue men’s size medium puffy jacket that I bought in the Nanning WalMart. It turns out I will wear that jacket a lot over the next two weeks. That is, until I abandon it in Myanmar! All we eat for lunch are the leftover dumplings that we took away from our lunch yesterday. Neither of us is very hungry after our big breakfast. We do pack some peanut butter and jelly sandwiches and fruit and other snacks for our train trip since we don’t know if we’ll be able to get dinner on the train. 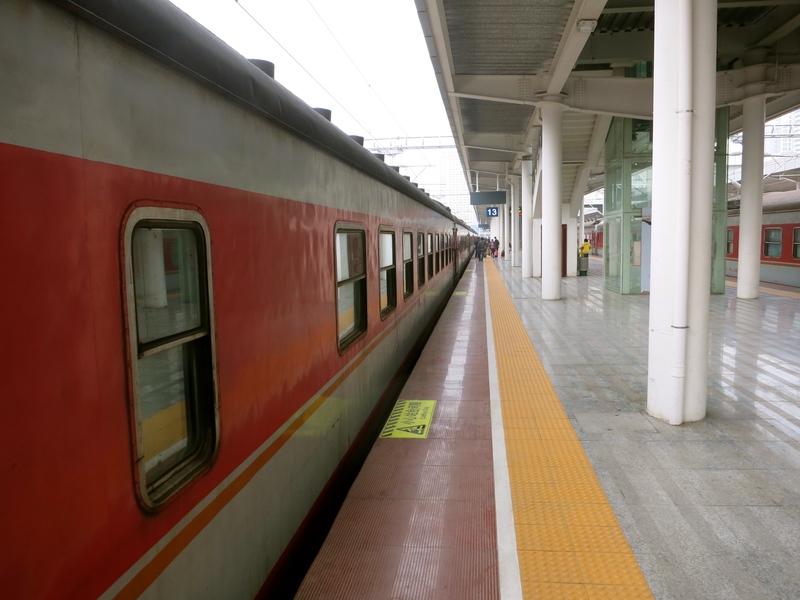 We arrive early to the Nanning Railway Station, with its usual chaotic hubbub of activity. I really hate sitting around in Chinese train stations, especially the Nanning one, as it’s so filthy and uncomfortable. Yet I always like to arrive early because I’m terrified of missing connections. Since Mike is here only 2 weeks, I’ve planned everything precisely. It’s the Spring Festival holiday time here in China, so I booked all our train tickets, hotels, and plane tickets in advance, just to make sure we could get where we needed to go without hassle. Finally, we load onto the old train like a herd of cattle, and settle in to our four person soft-sleeper compartment. We decide I’ll take the top bunk and Mike will take the bottom. On the other side of our 4-person compartment are two young men who don’t speak to each other; obviously they are strangers. We sit for a long time on Mike’s bottom bunk until it gets dark, which isn’t long after we chug off. 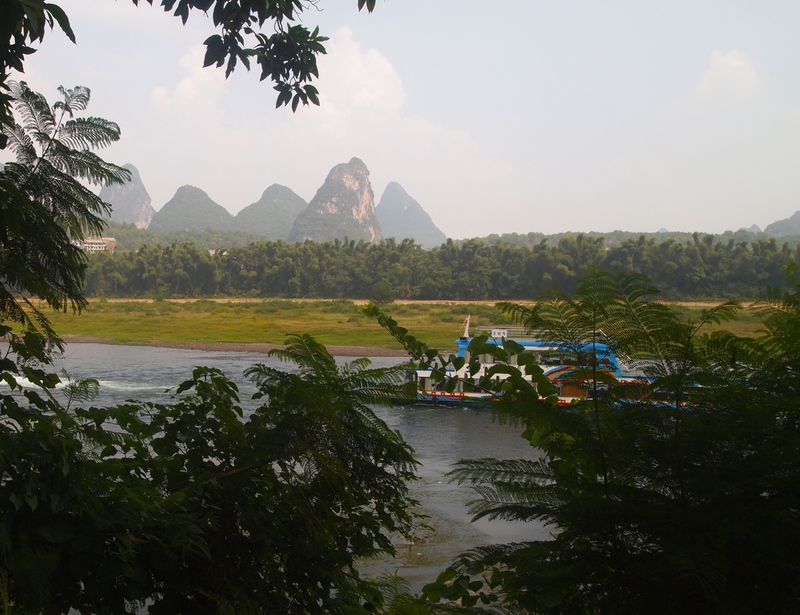 We do get to see about an hour’s worth of scenery, mostly the city of Nanning. 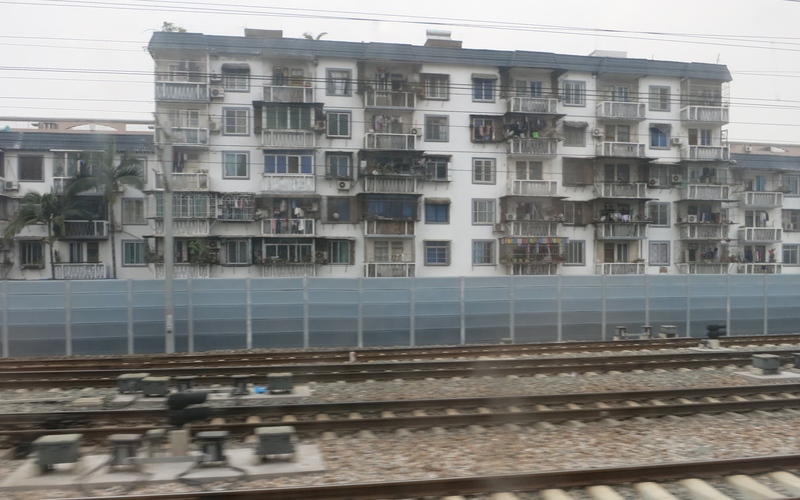 We pass by the new Nanning Railway Station on the east side of the city (I live on the west side). I only just heard about this new station and it looks gleaming and fresh. In the aisles outside the compartments are little fold-down seats in case someone would like to read or eat while the other people in the compartment are sleeping. Luckily on the soft-sleeper cars, we do have a door to our compartment. 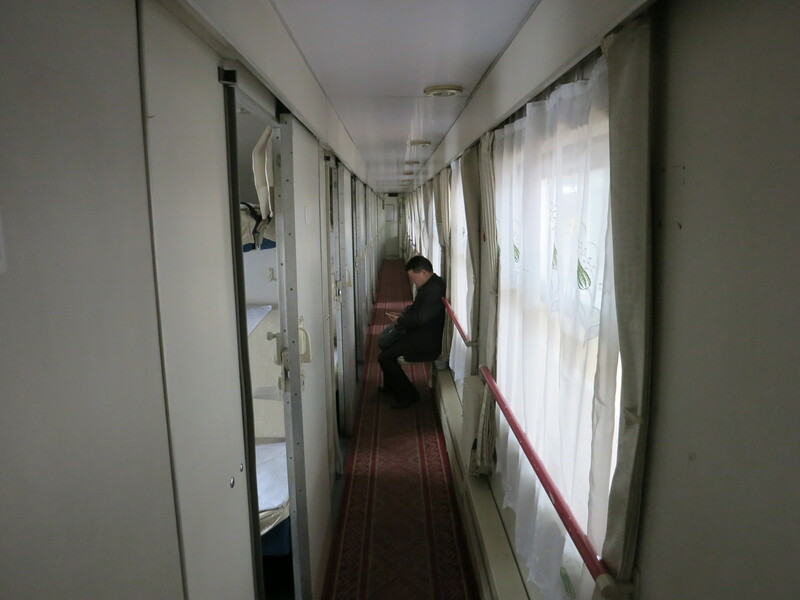 The hard-sleeper compartments have six bunks and no doors. Various vendors walk periodically down the aisles offering snack foods. It’s possible there is a dining car somewhere on the train but as we brought our sandwiches, we’re fine with what we have. The toilet is a hole in the floor at the end of the car. Like trains in India, it feeds directly onto the railway tracks. The doors are immediately locked by the attendants whenever the train comes to a stop. Once it gets dark, there isn’t much to do and I decide I’d like to get in my top bunk to read. Each bunk has a little overhead light which makes this possible. The top bunk is so high that I can’t climb up; Mike has to push me by my behind like I’m a sack of potatoes. When I get to the top, I get under the covers and wriggle about trying to take off my bra and change into a sleeping shirt. I don’t know why I bother hiding under the covers as the boy on the top bunk across from me is totally engrossed in a game on his phone. I read awhile until I have to go to the bathroom. When I do, I have just as hard a time getting down from the bunk as I had getting up. At this point Mike gallantly offers to take the top bunk and let me have the bottom. Ah, much better. At first I thought the author was annoying and spoiled by her high-class life in L.A. and her refusal to eat dinner alone once she separated from her husband and found herself in Guatemala and Mexico. 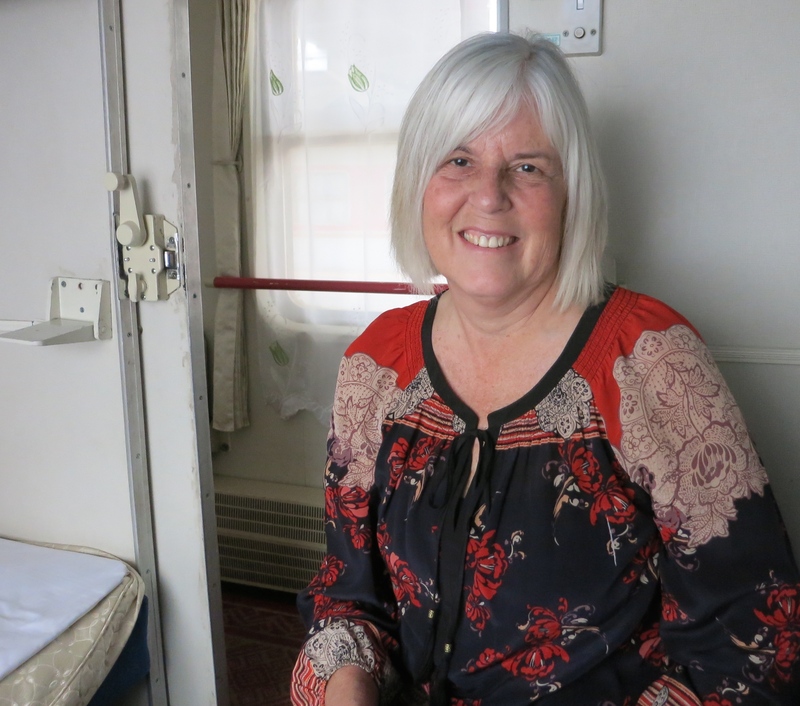 She would stay in her hotel rather than face being pitied by fellow diners as she ate dinner alone and “friendless.” It seems she always needed to be surrounded by community, and that was the thing that made her happiest. I have trouble relating to this as I love my time alone and don’t feel the need to be surrounded by people all the time. The author easily talks to strangers and is able to win their trust, enough so to be invited to stay with them for months or even years! I am totally unable to do this and do admire her ability to make friends so easily, but I would crave my solitude too much to stay with random people all the time. Also, she is able to totally trust strangers; I can’t do this at all! I almost always distrust people at first, until I get to know them. So she is admirable in this respect, if not even a little foolish. However, her trust seems to have served her well. In the end, I found the book lacking somehow; I don’t think I got a true sense of Rita and her emotional struggles; I found much of the book to be on the surface and thus it didn’t impact me emotionally. As a reader, I always want to feel the struggles and humanity of a person, and to sympathize with the characters (the author in this case), or at least relate on some level. I believe Tales of a Female Nomad missed the mark somehow as I always felt one step removed from the life Rita chose to live. I never felt any great bond with the author although we have both traveled extensively, due to the different ways we have chosen to travel. Throughout the night, the two young men in the opposite bunks are awake either watching movies on their phones or playing games. The movie the one boy is watching must be hilarious, because he keeps laughing all night long. What I don’t understand is how they have enough battery charge in their phones to keep this up all night. I had to turn off my phone early in the evening as my charge rapidly evaporated. He was using a battery to charge the phone, but even when I’ve used such a battery charger for such a long time, the charge has run out. These Chinese phones must be better than my iPhone 5. 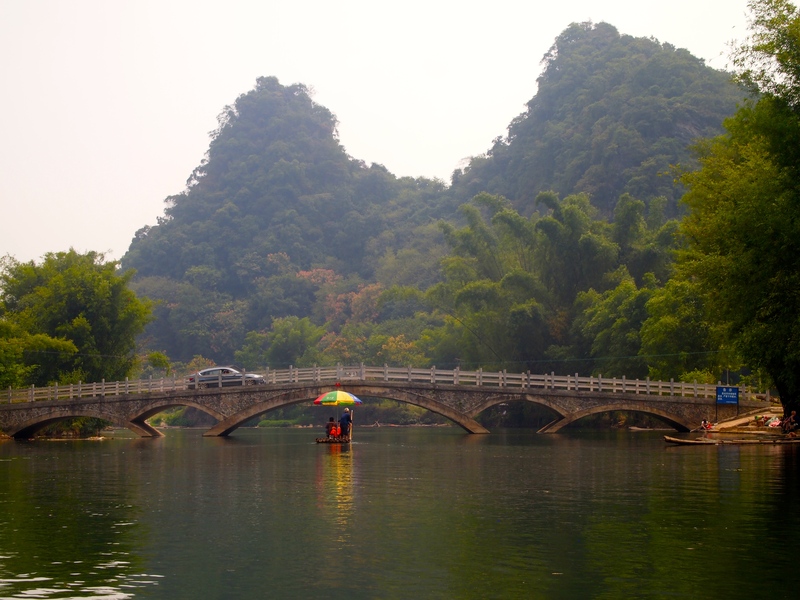 Monday, October 6: The Yangshuo River View Hotel must truly be a family affair, because today Vivian’s husband drives me in his van to the launch spot for the bamboo boat ride down the YuLong River. 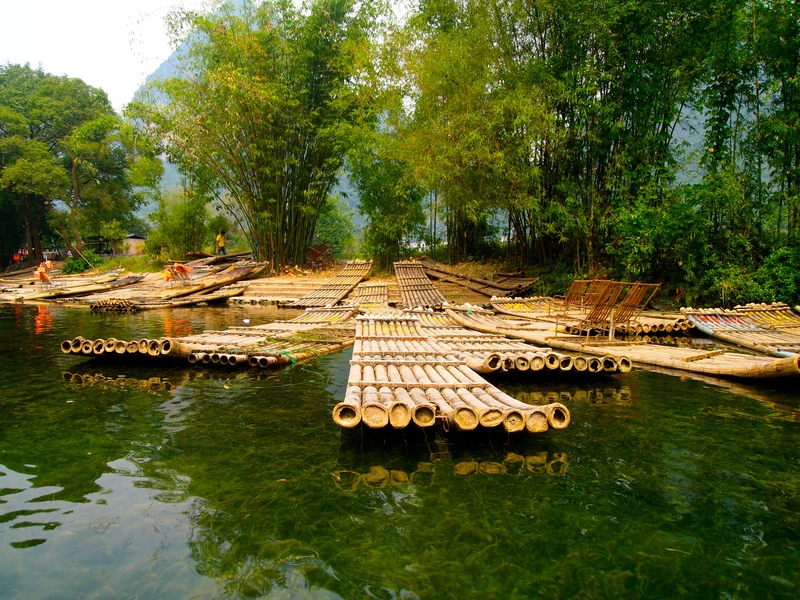 It’s supposed to be a two-hour drift down the river to a bridge near town. Sadly I don’t remember either the launch site name or the bridge. 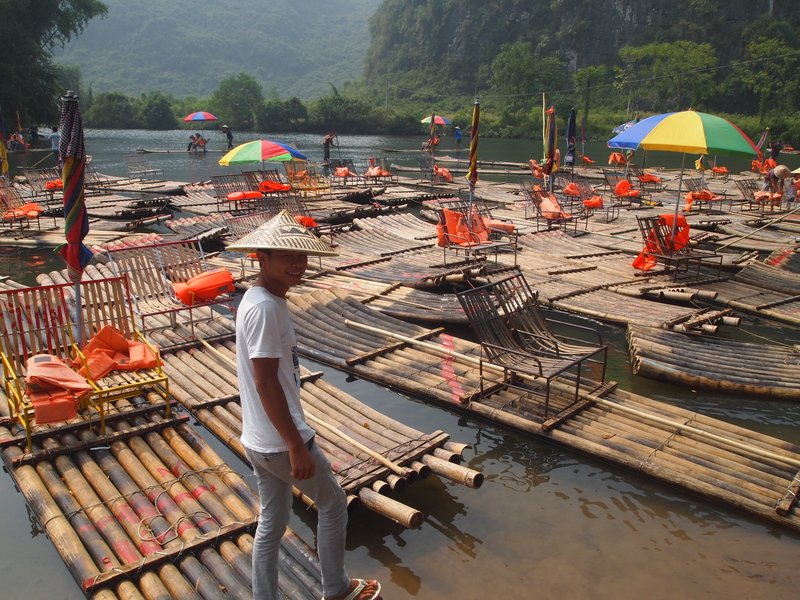 When we arrive at the bustling spot, the boats are all jumbled together waiting for customers. It’s nearly 11:00 a.m. 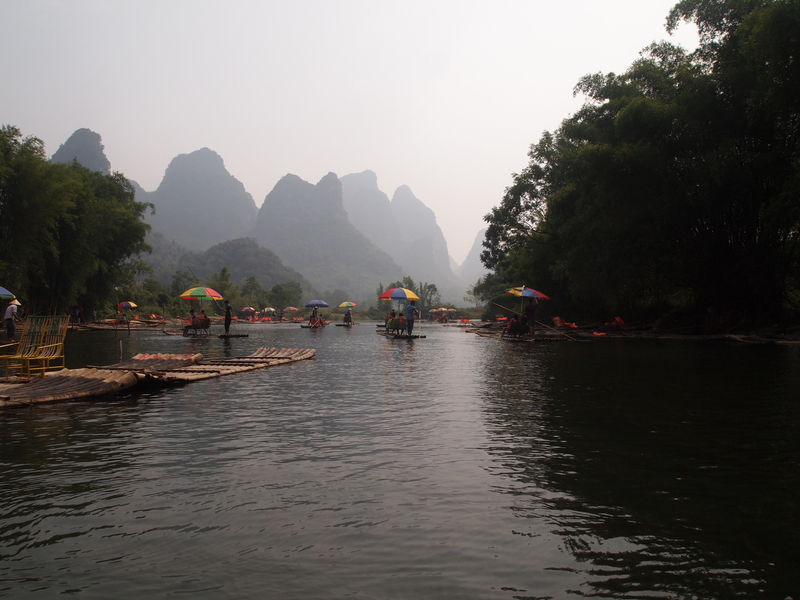 I need to leave Yangshuo this afternoon around 3:30 or 4:00 to head to Guilin for my 6:10 p.m. train. I’m not ready at all to leave this place, but my holiday ends tomorrow and it’s back to work on Wednesday. 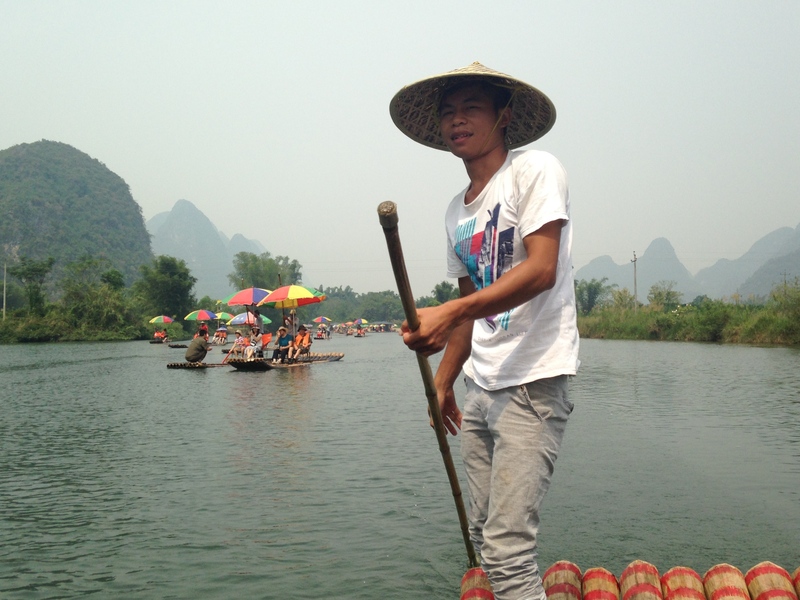 I’m guided to my own private boat by a young man who will be my boatman. 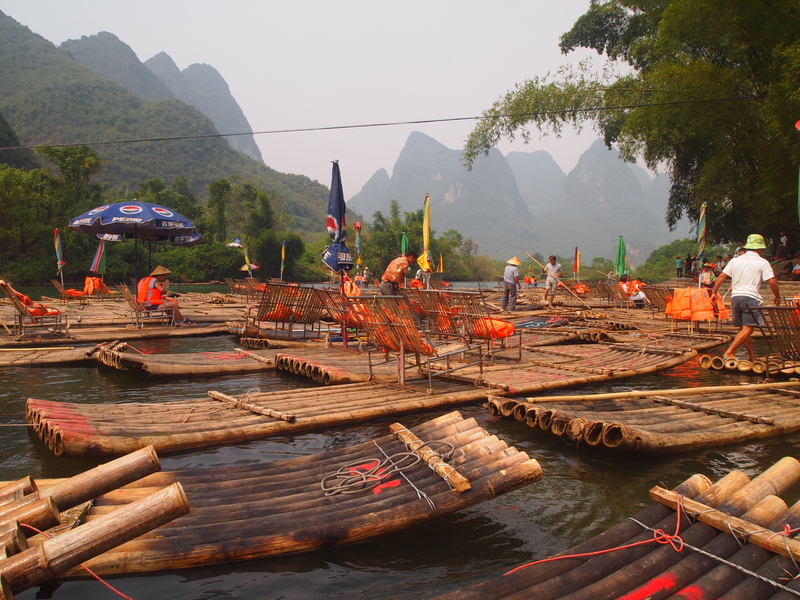 I have to climb unsteadily over a bunch of bobbing boats to get to mine. 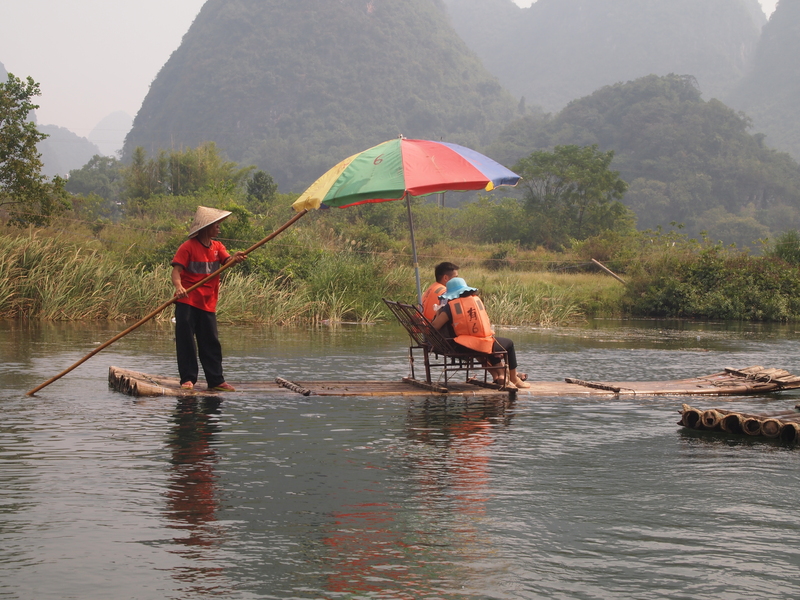 I guess the river must be really shallow because the boatmen use long poles to push the boats down the river using the river bed for leverage. 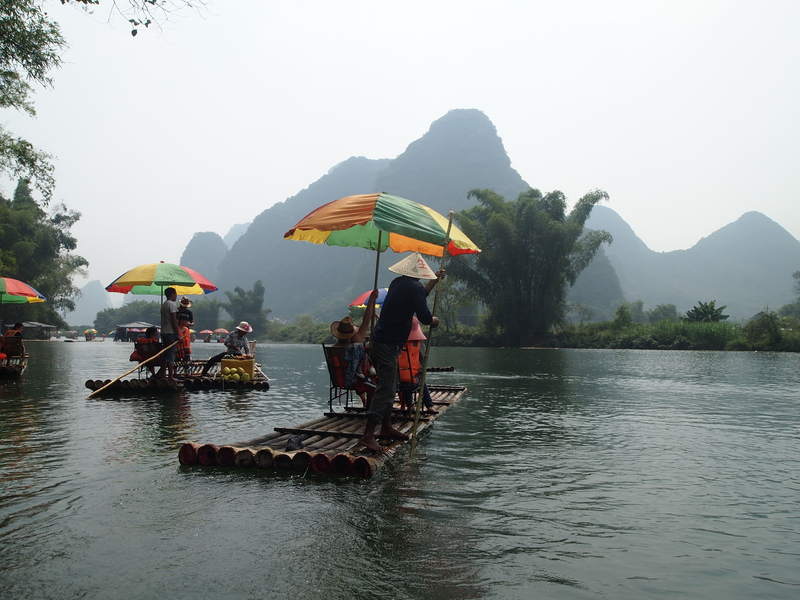 We finally break free of the other boats and drift down the river. The views again are stupendous, with the karsts around us in every direction. 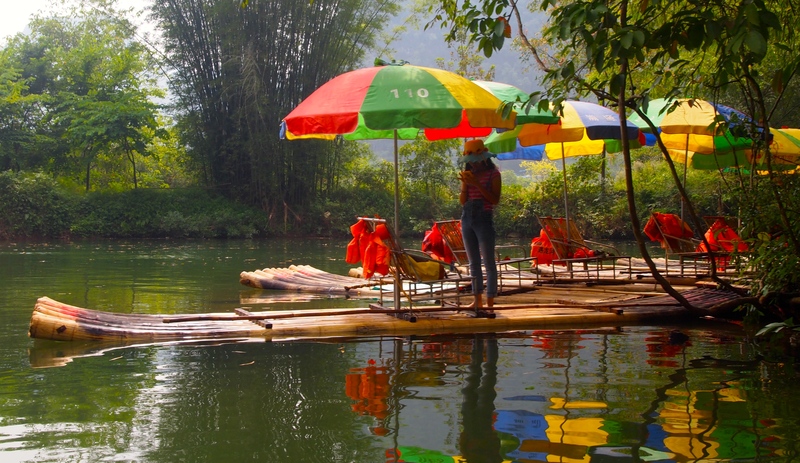 Everyone is cocooned in bright orange life vests and shaded by rainbow-colored umbrellas. 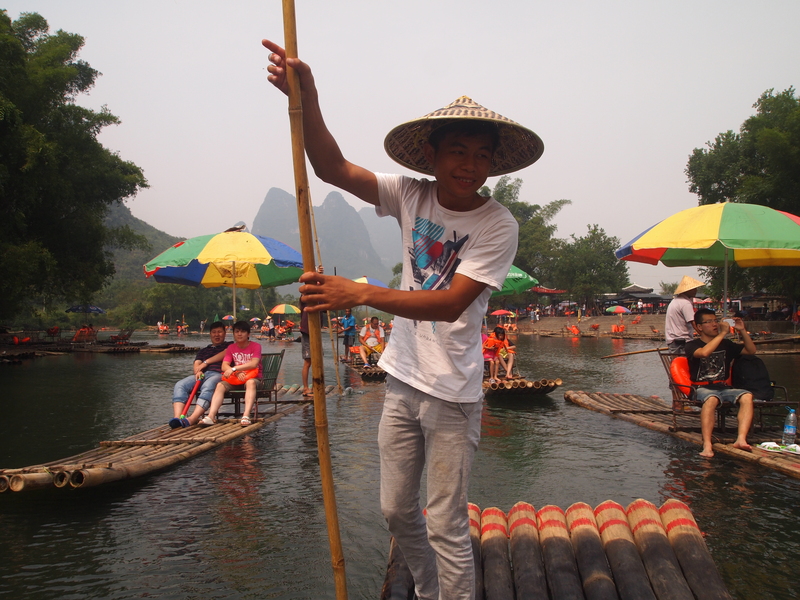 My boatman has to work hard with his pole. He doesn’t speak any English and of course I know no Chinese. There is no need for words, so we drift silently. 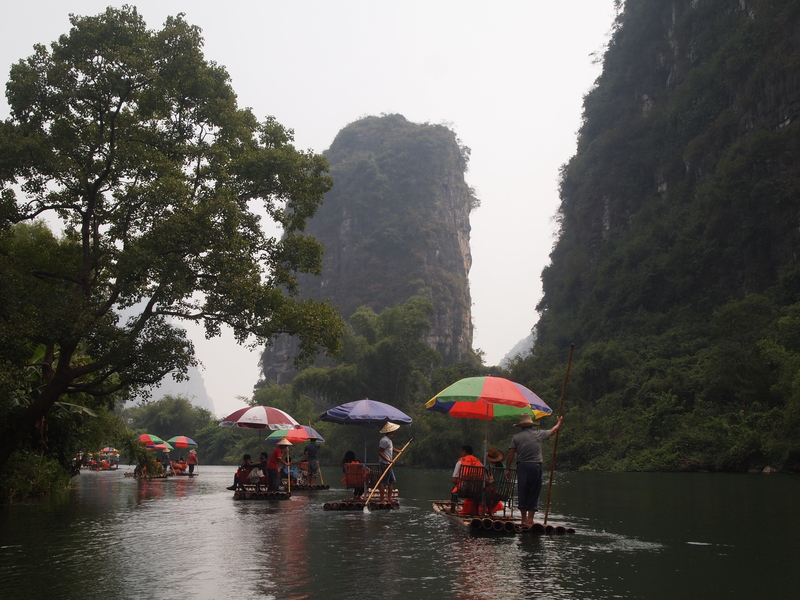 The boat passengers and boatmen on the other boats are pretty friendly, saying greetings of “Hello!” or “Nǐ Hǎo!” I enjoy taking photos of the Chinese on the boats around me, and they equally enjoy taking pictures of me, the only foreigner in their midst. Click on any of the photos below for a full-sized slide-show. 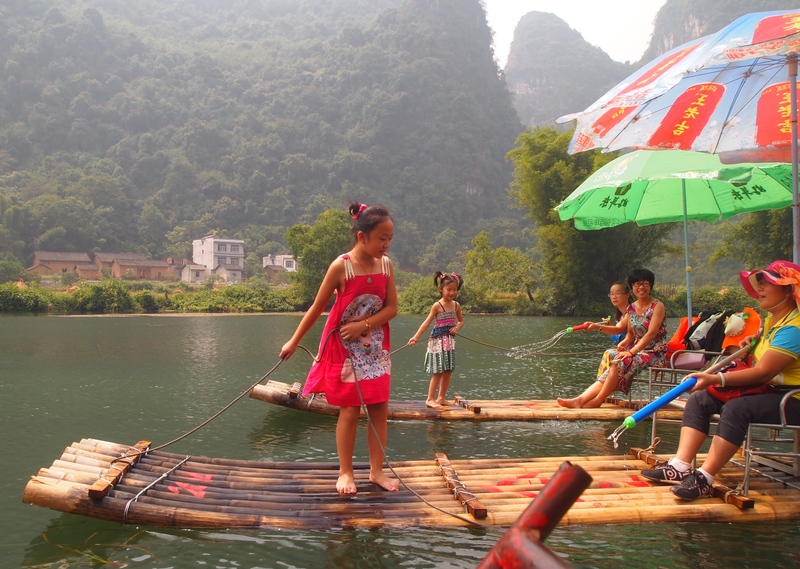 I enjoy watching these little girls standing at the end of their rafts in pretty dresses. i see some farmers and water buffalo along the shore, framed by picturesque haystacks. We pass another launch site that looks a little deserted. 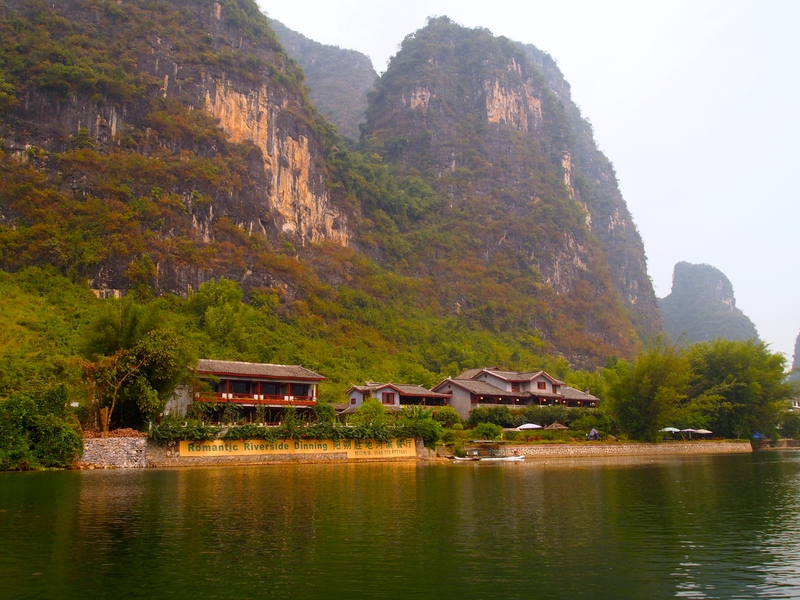 We pass by the Yangshuo Mountain Retreat. Audrey and I stopped here on our bike ride and saw the boaters going down the river. Now I’m one of the boaters. The water here is very shallow. 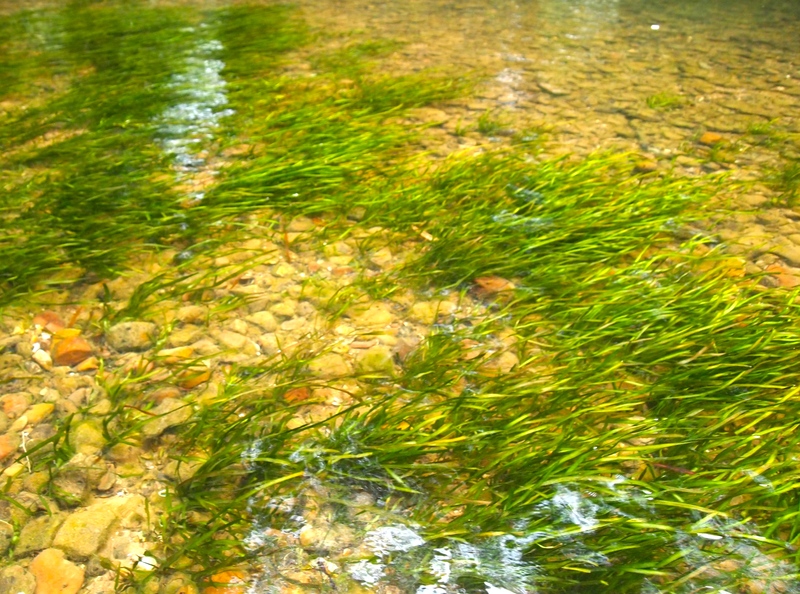 The grass rippling in the water is a little hypnotic. 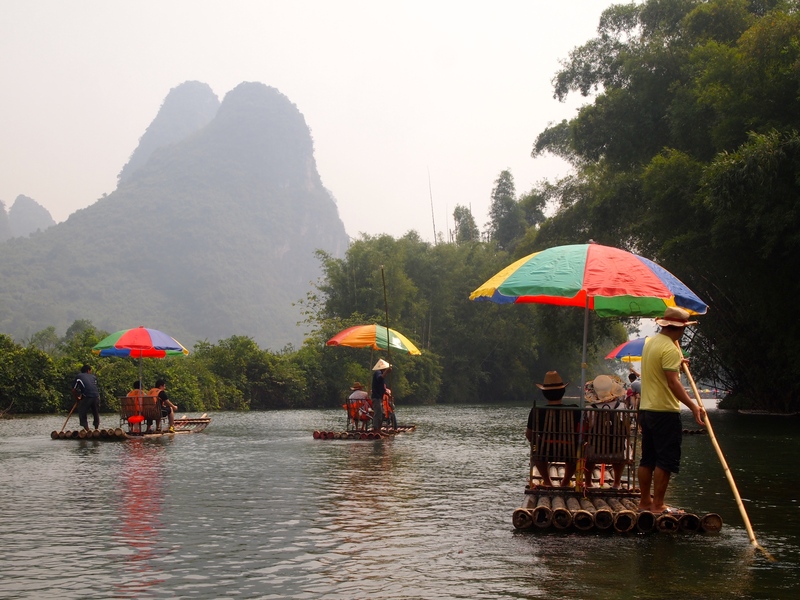 There are some places where people are stopping to eat, but my boatman just keeps pushing us downriver. This little bridge is a cute one. At another stopping place, I see this young lady checking her cell phone. On the way downriver, we cross a lot of dams, going down chutes and landing hard at the bottom, with water washing up over our bow. It adds a little thrill to the ride. I don’t think this couple is very thrilled at being stuck on the dam. 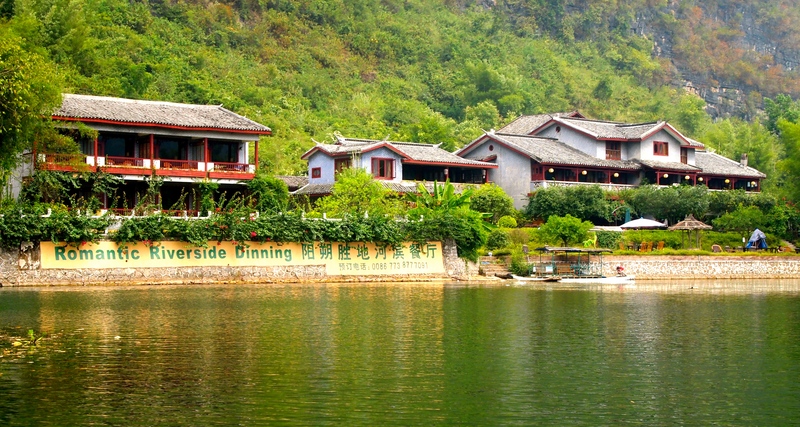 We pass some more pretty hotels along the river. Finally we come to this bridge. I look at my watch and see we’ve only been on the river for one hour. I figure my boatman is taking a break or letting me out to buy souvenirs, but then I realize he’s telling me this is the end. I was told this is a two-hour ride, so I don’t want to get off the boat, but the boatman keeps gesturing for me to get off. I’m not very happy about this as I paid for two-hour trip, so I call the hotel to talk to Matthew, the English-speaking manager. He talks to the boatman and then explains the situation to me. 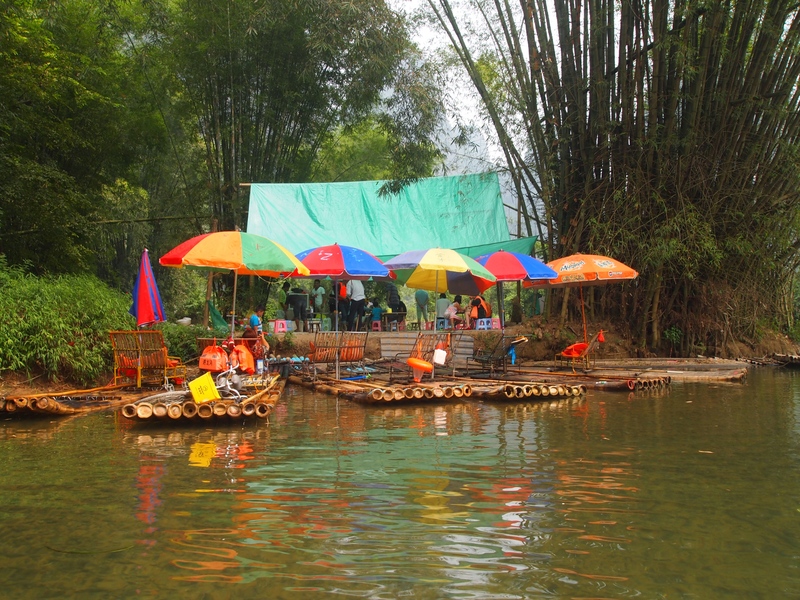 Apparently, the two-hour boat ride is for people who make stops along the way, like for photos or for meals. 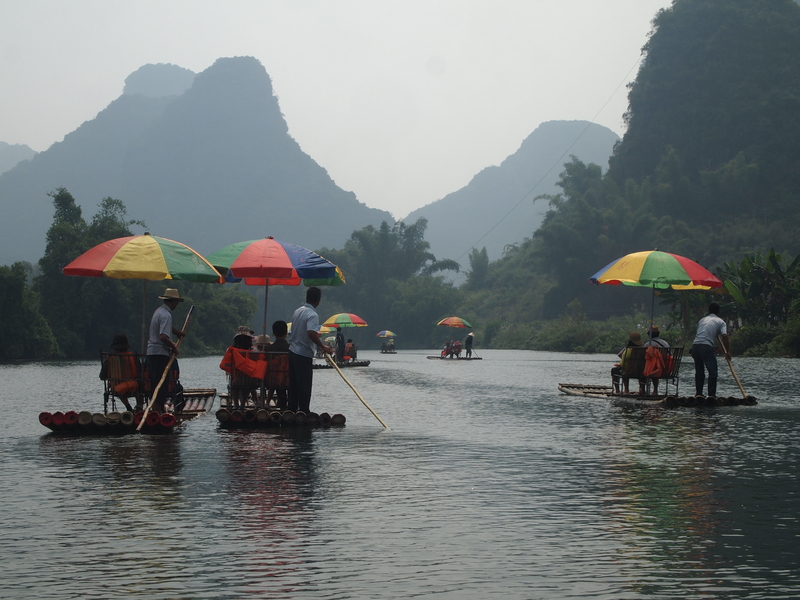 My boatman never offered me any stops, probably because he couldn’t speak English, but also partly because he could finish early and go upriver again to pick up another customer. I’m not very happy about being misled. I really did expect a full two hours of a BOAT RIDE, whether I made any stops along the way or not! I call Vivian to have her husband pick me up, and he comes shortly and takes me back to town. 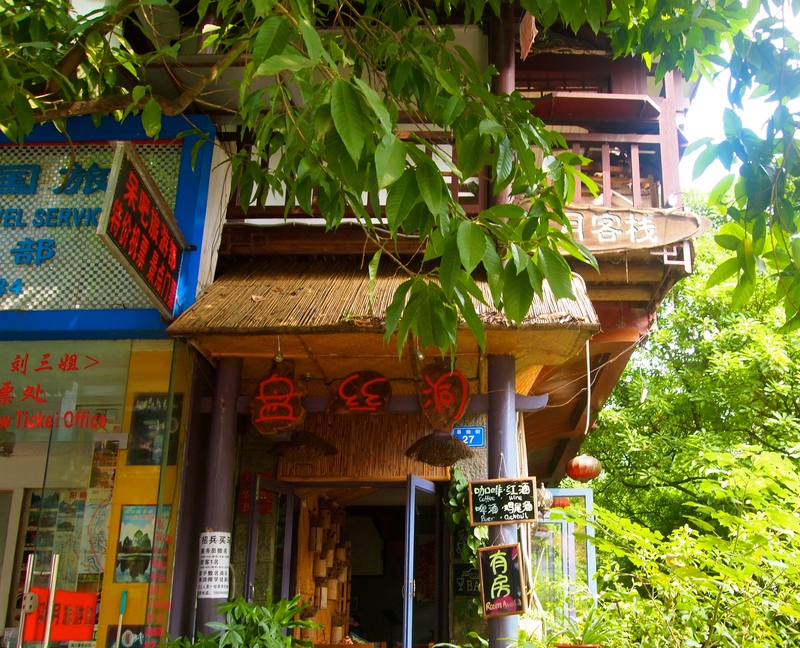 My Rough Guide to China had recommended the Pure Lotus Vegetarian Restaurant. I had tried to eat here another evening, but something was wrong with their cooking facility when I stopped by. Now I ask Vivian’s husband to drop me off here. 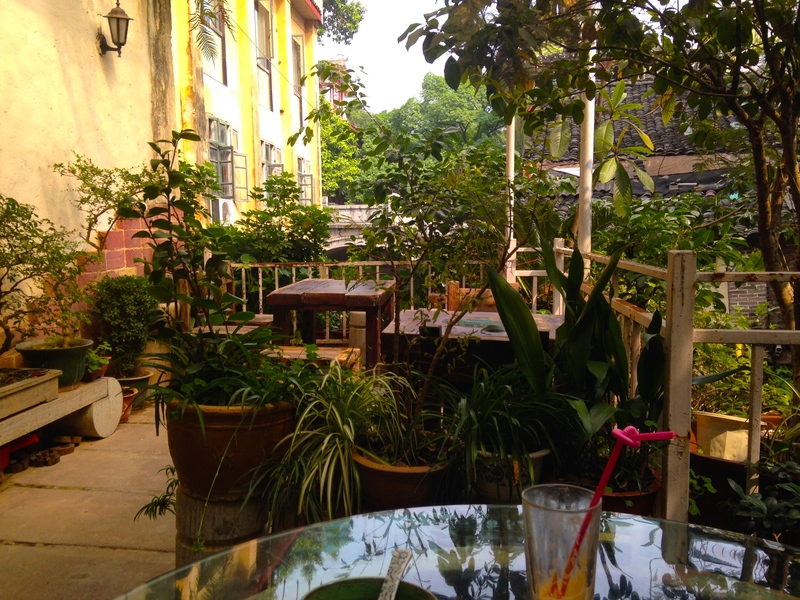 I sit on the lovely patio and order some grilled eggplant. When the eggplant comes, I don’t recognize it as eggplant; it looks like the mushy fringe of a damp mop. The eggplant tastes good, but it’s cooked in a lot of oil, and immediately I can feel my stomach churning. Again I’ve made the mistake of assuming that if I’m eating vegetables in China, my stomach will be okay. I’m going to have to face the fact that if the food, meat or vegetables, is cooked in oil, I’m possibly going to get sick. I don’t know why sometimes the oily food makes me sick and sometimes not. Feeling sick from this meal makes for a long trip back to Nanning. 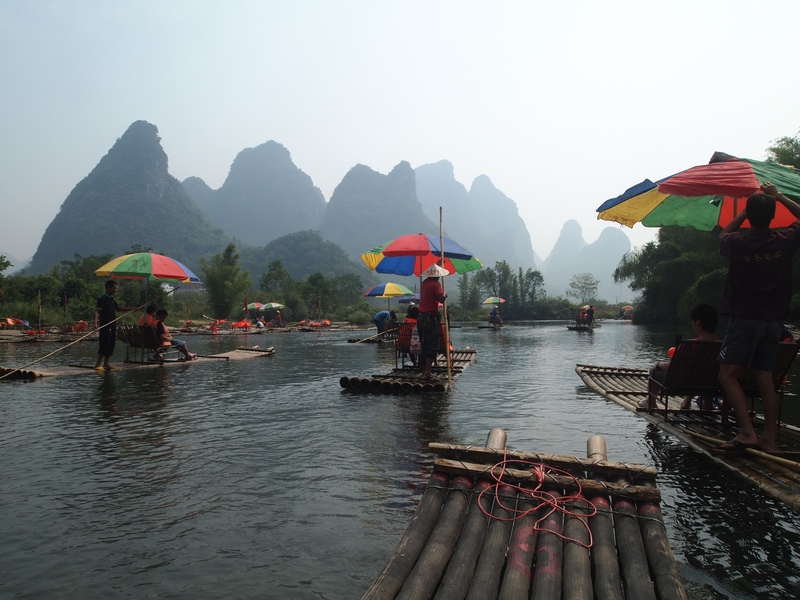 I don’t feel like taking a bus this time to Guilin, so I hire a taxi for 260 yuan (~ $42). I get to the train station way too early, and the whole time I’m sitting there, my stomach is churning. On the 2 hour 40 minute train ride home, my stomach continues to churn. When I finally arrive back at the Nanning Railway Station, the crowds getting off the train are unbelievable. We move like cattle off the train platform and are chuted into two stairwells. We are so packed that I feel claustrophobic. I have a lot of anxiety; television shows I’ve seen about stampeding crowds flash before my eyes. I imagine getting crushed in a tired and irritable crowd of people anxious to get home. Finally, after what seems like an interminable time, we are released outdoors. It doesn’t end here. At the bus stops, the crowds are pushing onto the buses that come up to the train station. I don’t want to be packed on a bus with all those people, so I look in vain for a taxi. There are none to be found; every one seems to be taken. I’m tired and I just want to get home. Finally, an older guy on a motorbike asks me where I’m going. I tell him Guangxi Daxue (university). I must not be saying it right because he doesn’t seem to understand me. In desperation, I pull out the Pleco app on my phone and show him the word. He repeats what I thought I said, and then he sticks my suitcase between his legs on the motorbike and tells me to hop on. In some countries this might be dangerous, but I don’t think it is in China. I’m so happy to be back on a motorbike again and on my way home. It’s quite cool tonight and the breeze feels incredibly refreshing on my skin. I love the sense of freedom that riding on a motorbike brings. 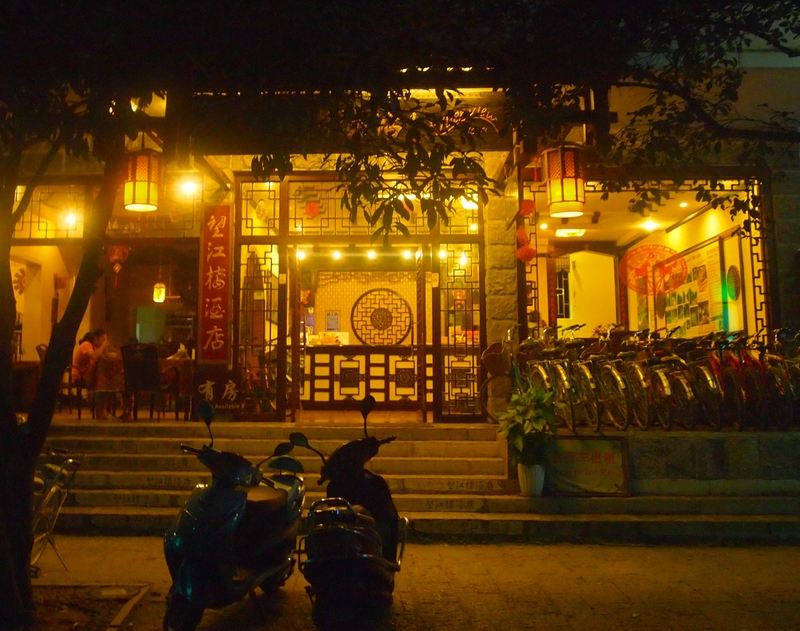 We ride directly to the university gate, where I hop off and pay him 20 yuan (~ $3.26) and walk back to my room. There, I collapse on my bed after a long day. 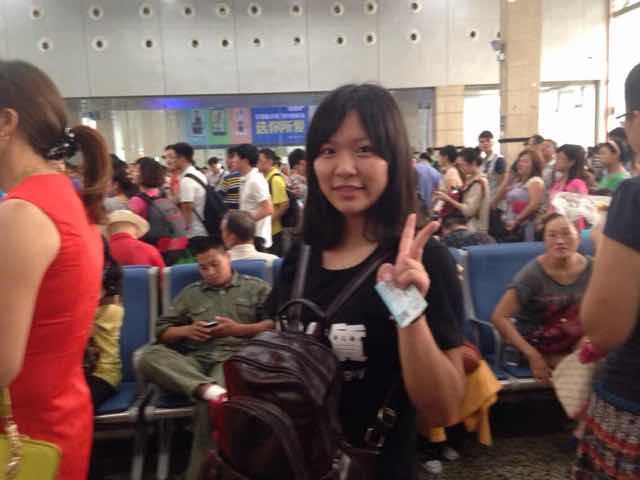 Thursday, October 2: I leave my apartment at 6:40 a.m. and reach the main gate of the university at around 7, where I take the number 10 bus, arriving with the crowds at the Nanning Railway Station about 20 minutes later. There I accidentally meet one of my students, Eva, who had told me on Tuesday that she was taking the 8:20 train to Guilin, her hometown. She tells me she read that yesterday, the first day of the National Holiday, this station “saw 140,000 people.” I believe it. Even today, for this early train, the station is packed. I get comfortable on an aisle seat next to a friendly Chinese girl. The fast train is comfortable, modern and smooth. My ticket was 111 yuan, or $18. 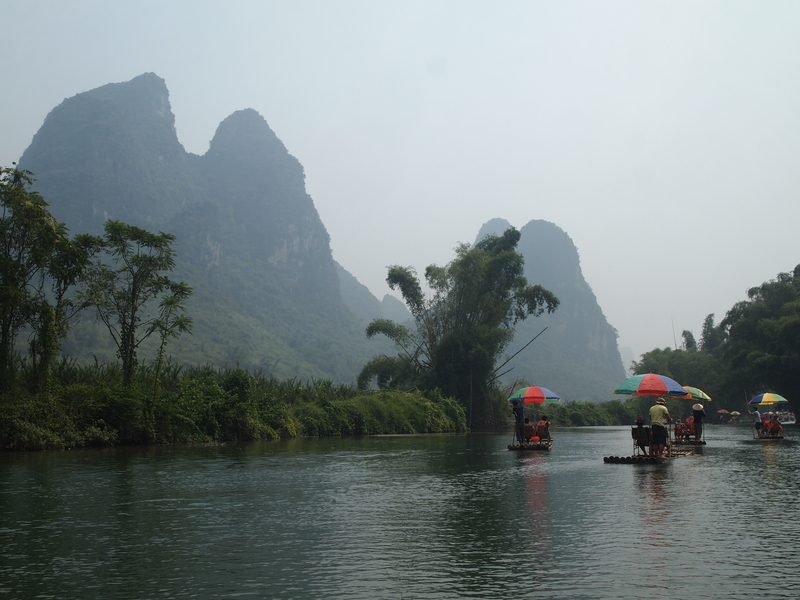 Even two hours south of Guilin, I begin to see the limestone karsts for which the area is famous. There are thousands of them stretching endlessly on the horizon. 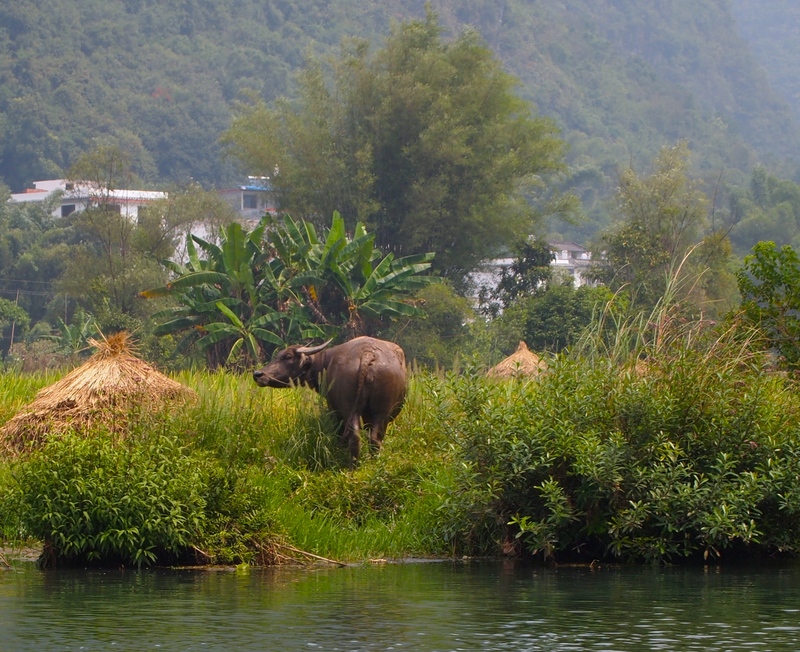 We pass beautiful farmland, farmers in conical hats, water buffalo, and neat little paths threading between fields. Some farms have ponds, and some of those have lotus blossoms. I see sprawling groves of tall spindly trees with tufts of green at the top. I’m not sure what they are, but they’re delicate and pretty. I love watching the countryside outside the train window even though I don’t have a window seat and I’m constantly leaning forward to look over my seat mate’s head or lap. 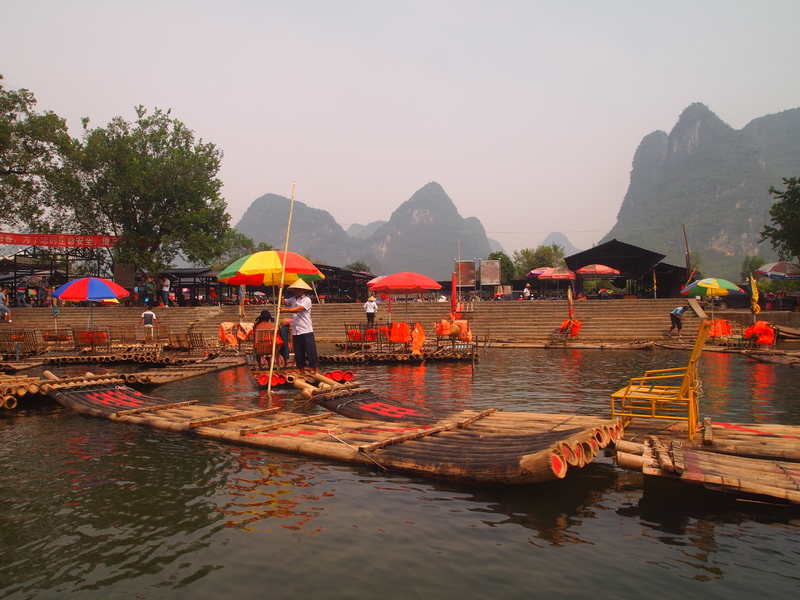 When we arrive in Guilin, I catch a bus to Yangshuo for 40 yuan ($6.51). 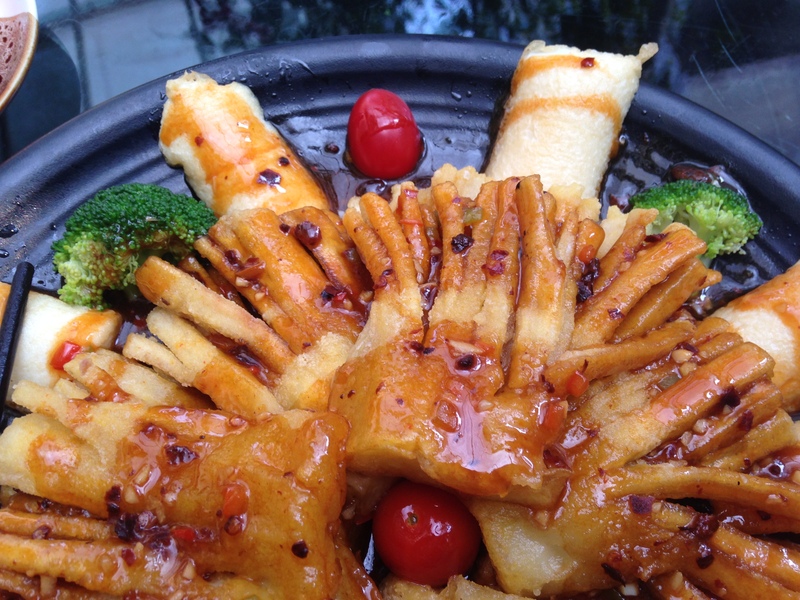 I think this is the special “holiday price,” because I’ve heard it’s normally 20 yuan ($3.26). Either way, it’s dirt cheap! 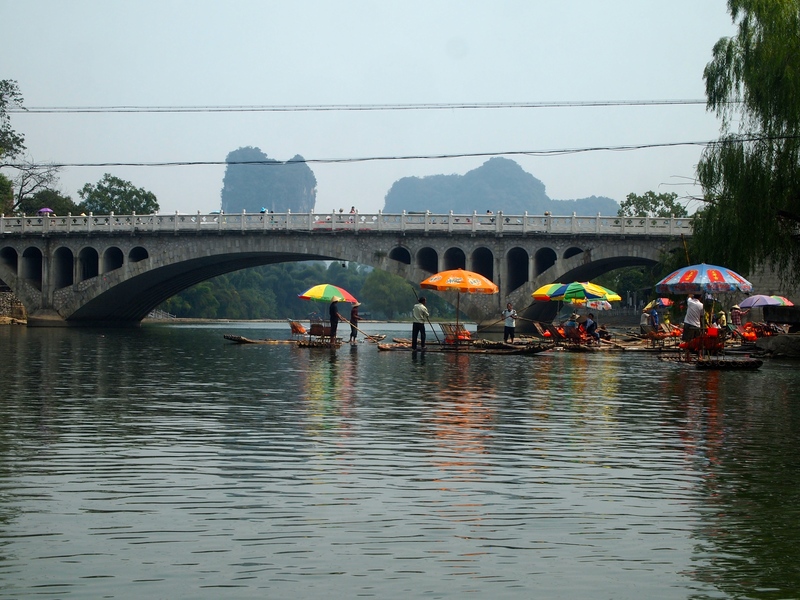 By the time we arrive at the Yangshuo bus station at 1:00, I’m desperate for a bathroom. It’s been a very bumpy ride! As always, the public bathrooms are disgusting, the Chinese hole-in-the-floor variety. I encountered one outside the Guilin bus station that didn’t even have flush mechanisms; woman were squatting over a trough with no doors to shield themselves from curious eyes! You can imagine the smell. Yikes! I could rant on and on about this, but what’s the point? I try to pretend I’m not actually using these toilets; I simply imagine I’m somewhere else. 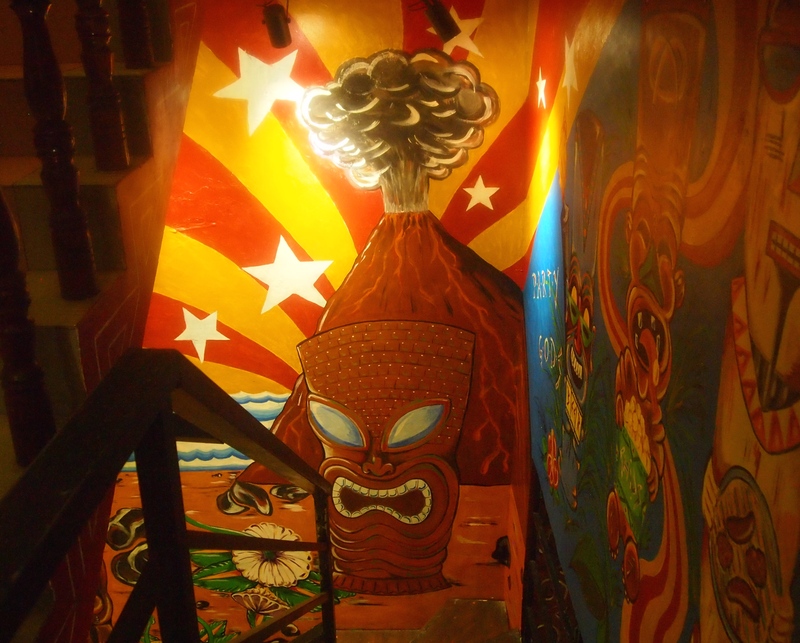 It’s how I’ve learned to deal with a lot of unpleasant situations while traveling. I’ve already asked several people about the whereabouts of my hotel, but I only have it written in English. At this Yangshuo bus “station” bathroom, I find an American girl and ask if she knows where it is. A Chinese girl is standing in line and lucky for me she speaks English. She writes the Chinese name of my hotel on the copy of my confirmation. 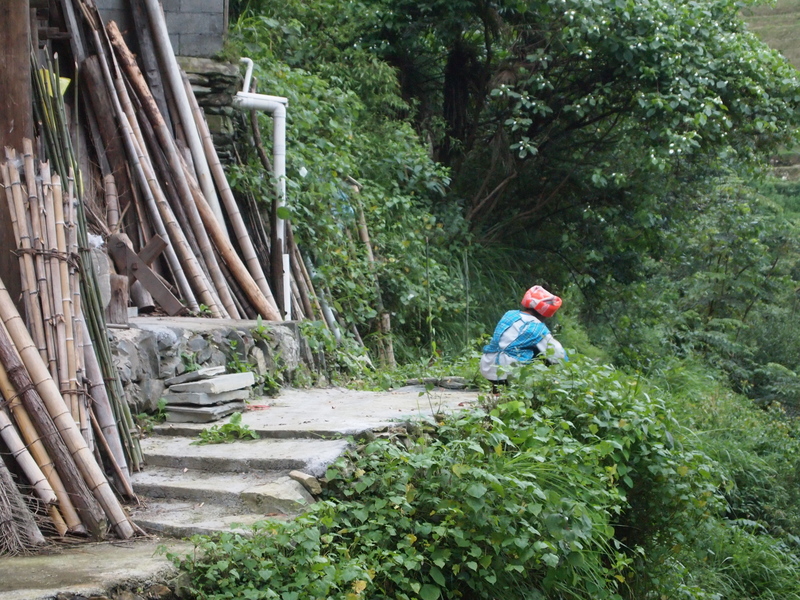 It’s amazing when traveling that you often find helpers in the most unlikely places. 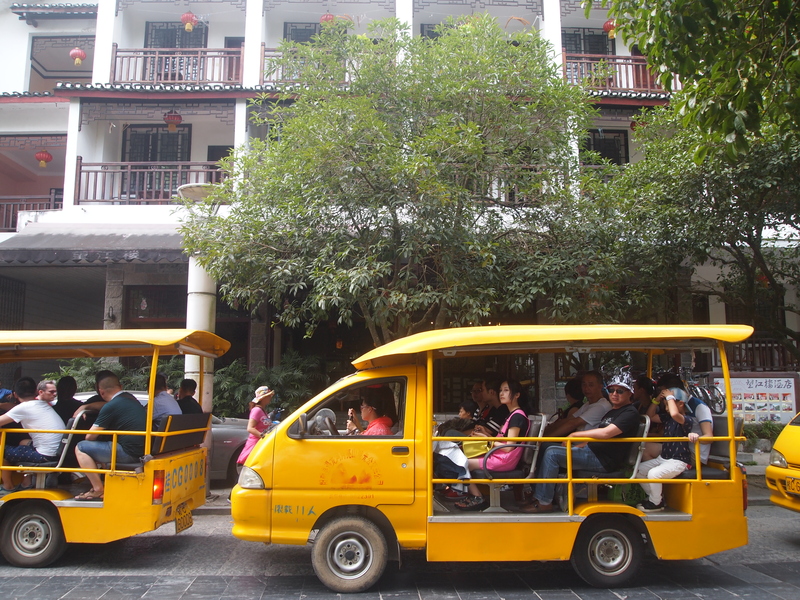 I find a moto-taxi and show him the Chinese name of my hotel. 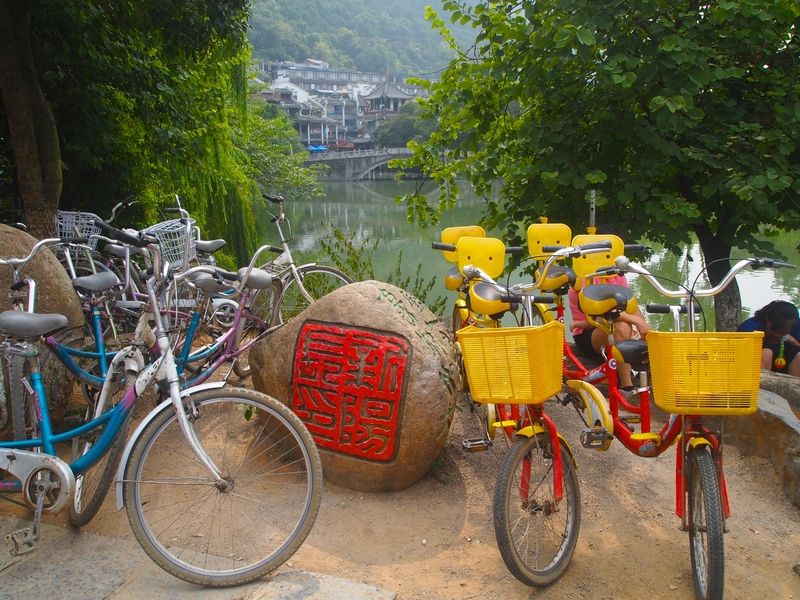 He ties my suitcase to the back of the bike, and I hang on to his tiny waist as he zips through Yangshuo. It would have been quite a long walk! He charges me 20 yuan for this thrilling ride (~$3.26). I finally arrive at my destination at 1:30, 7 hours after I walked out my front door this morning. 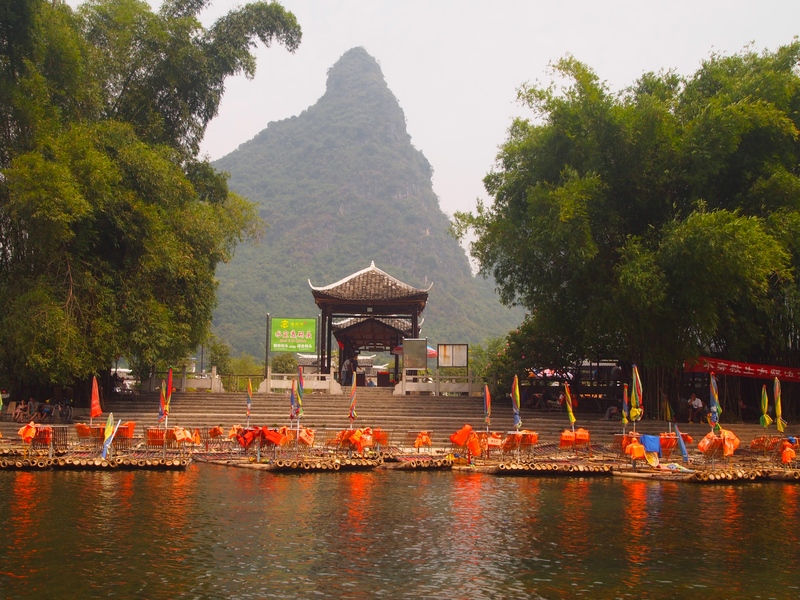 People have told me to expect prices double or up to 5x as much as normal during this National Holiday, because Yangshuo is the ultimate tourist destination in the south of China. Still, in Western terms, I find everything very cheap. 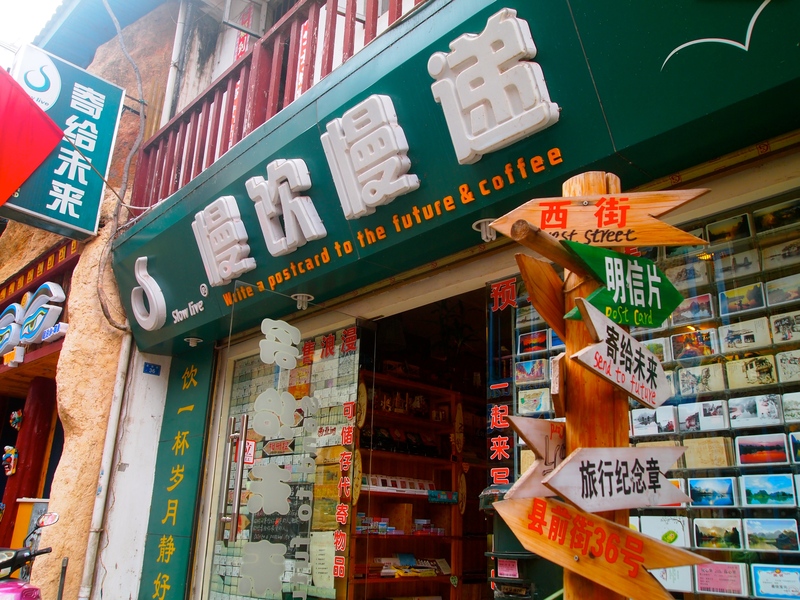 I’m not going to complain if someone charges me 20 yuan instead of 10 yuan for something. It seems like penny-pinching. 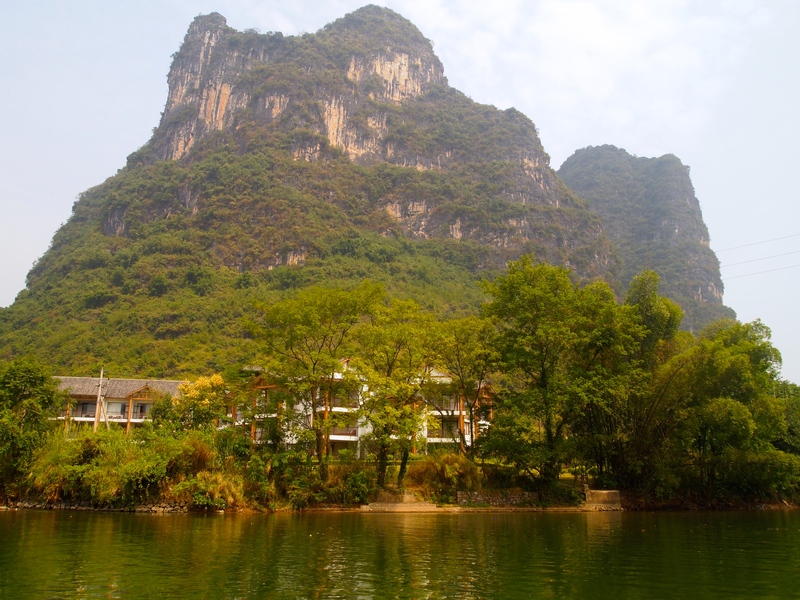 I check in immediately to my hotel, the Yangshuo River View Hotel. I had booked this ahead of time on Agoda.com. 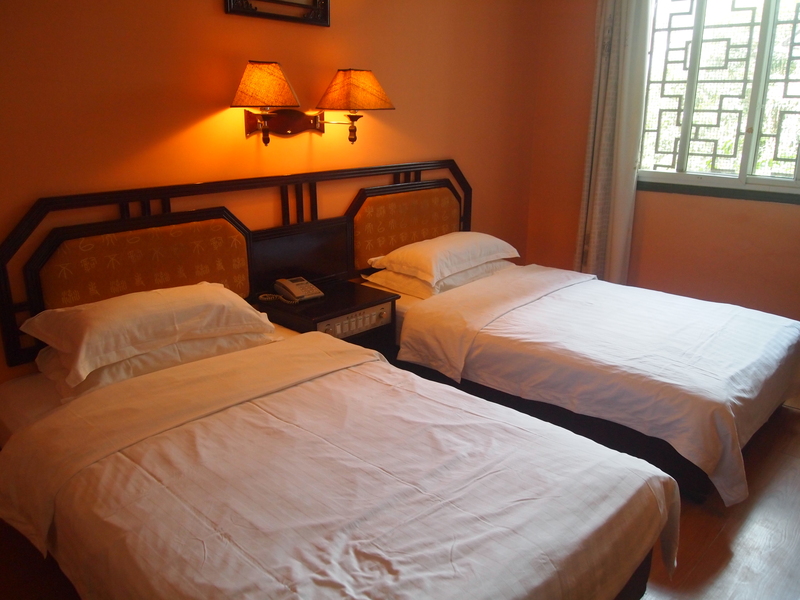 Again, I know the prices are higher than normal, but I wanted to travel during the holiday and I wanted a nice room. 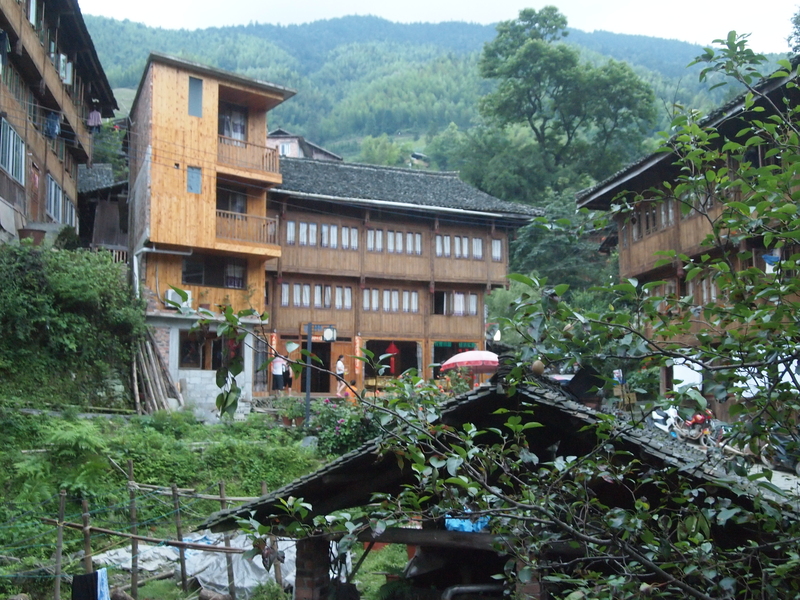 I pay around $87.50/night, which is really high for China. I don’t have a river view because it was one of the last available rooms, and the river view rooms were more expensive anyway. 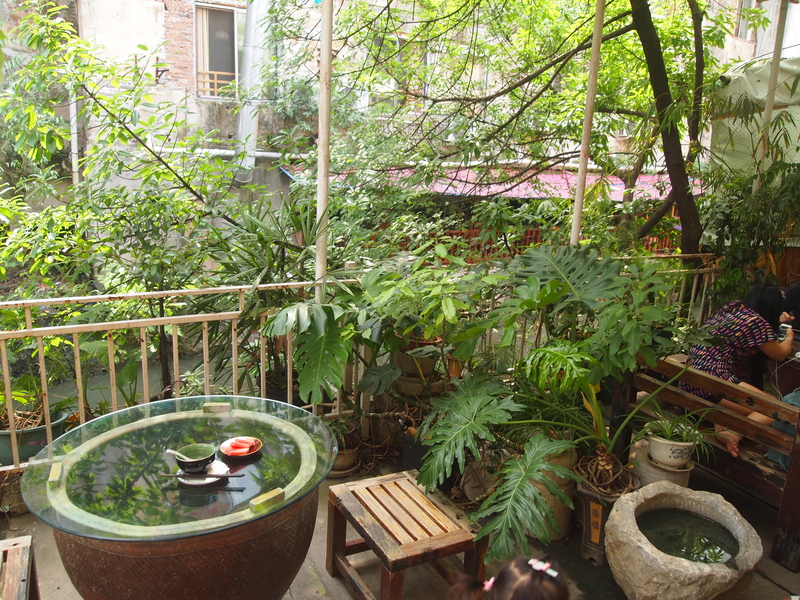 I’m actually glad I face a courtyard; it’s much quieter than the streetside river view would be. The hotel receptionists speak excellent English and they’re very helpful. 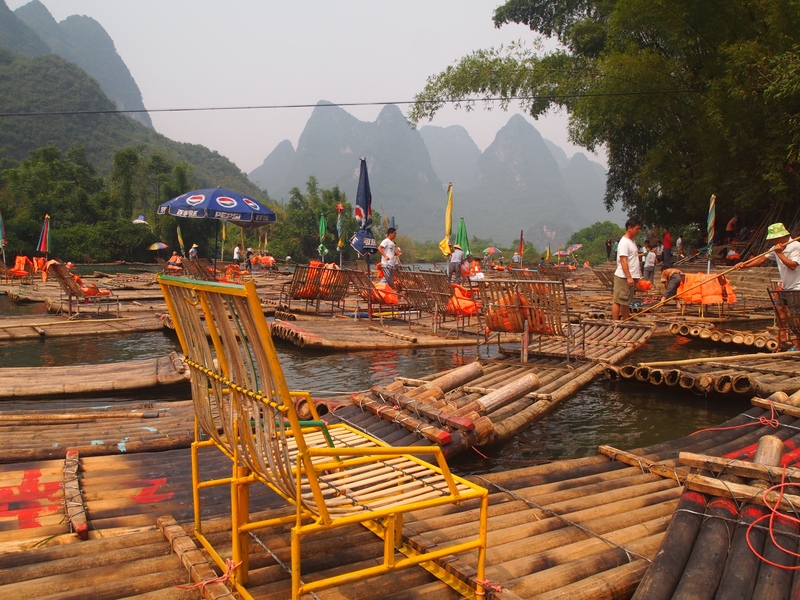 I arrange a cruise down the Li River for tomorrow morning (220 yuan, around $36). Then I go out to explore the town. 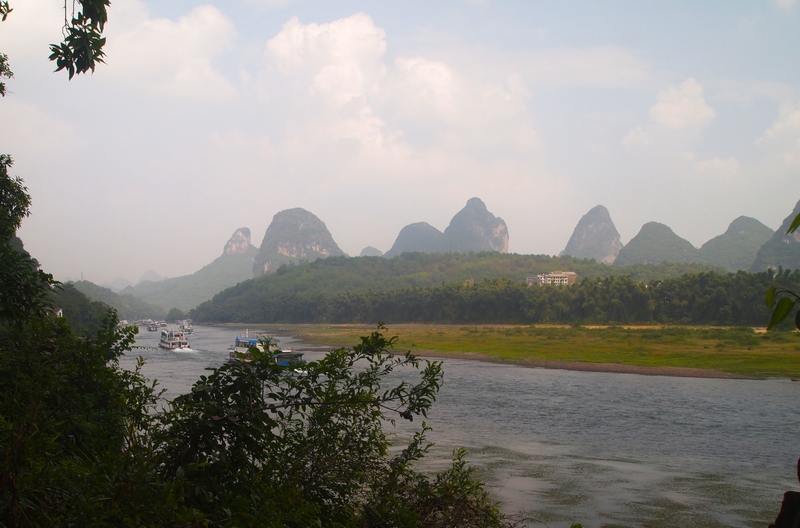 First I walk down the street in front of the hotel, which borders the Li River. 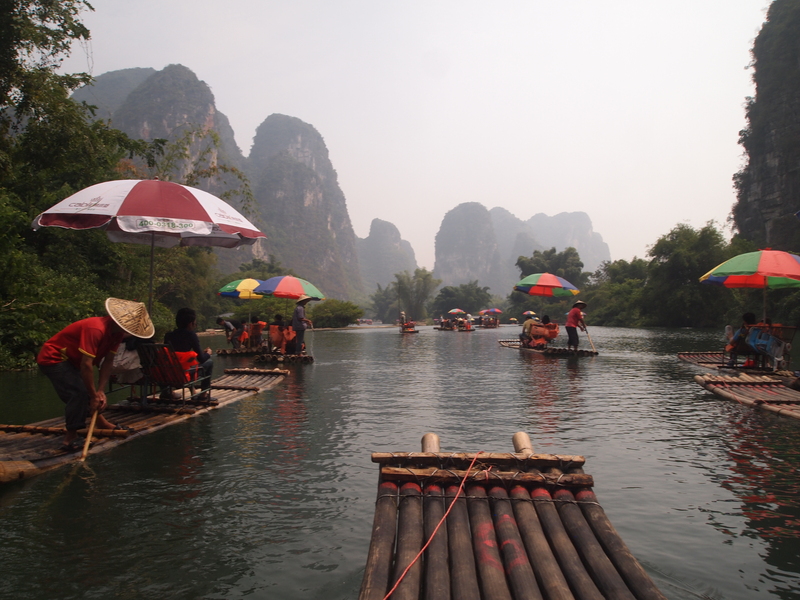 I get a glimpse of the pretty karsts and boats cruising down the river. 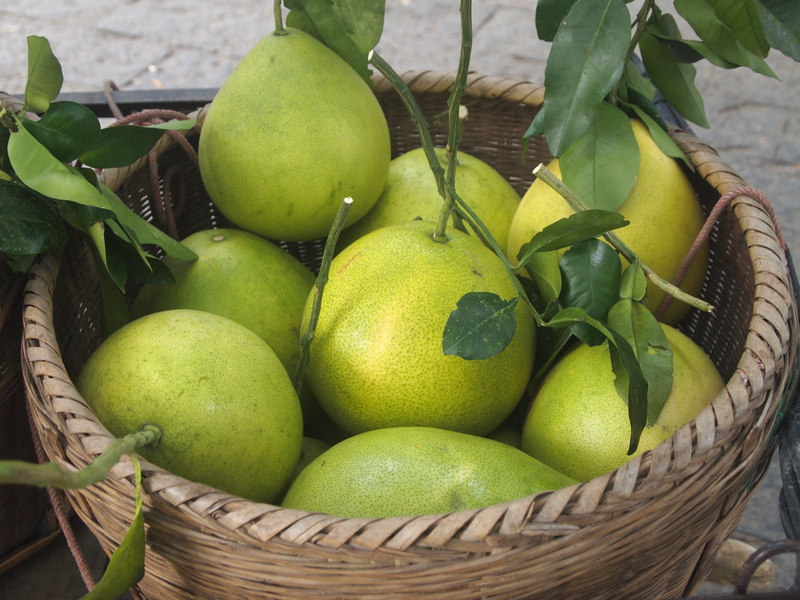 Along the sidewalk, the merchants are in full swing. The town is very cute and touristy, with colorful shops selling the typical things you find in these kinds of towns everywhere: pashmina shawls, flowing skirts, bohemian tops, hippie handbags, silk scarves, “do your name in Chinese character” scrolls, whimsical lanterns, postcards and trinkets. I’m always temped most by the lanterns, but I wouldn’t know how to transport one, so I don’t buy. 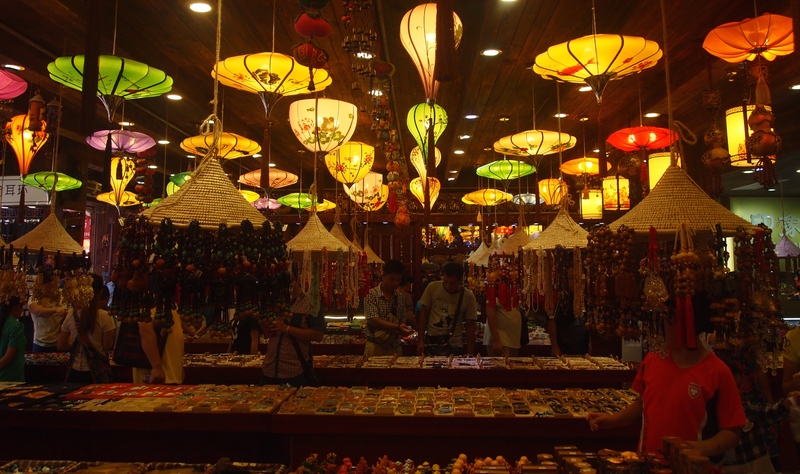 I want all these lanterns! 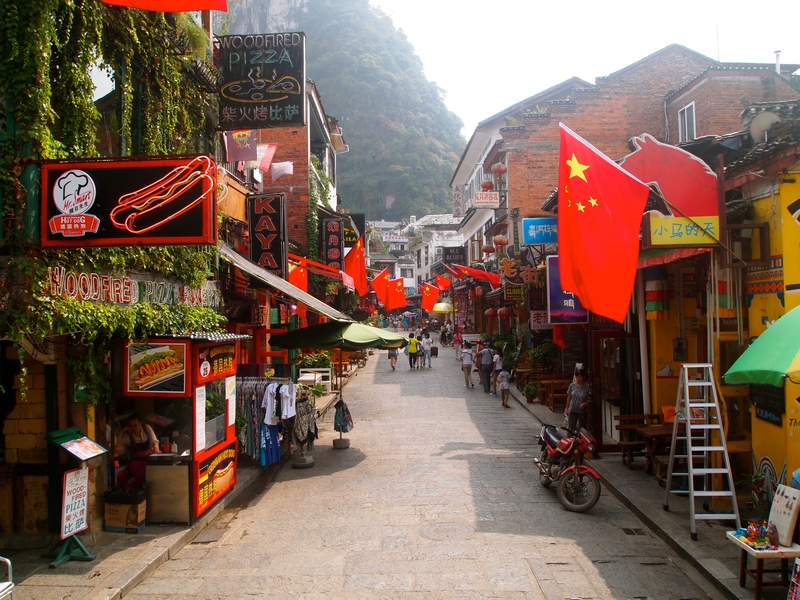 There are scores of fruit juice shops or stands, coffee shops, musicians performing in hopes of selling CDs, flags flying for the National Holiday and views of the karsts at the end of streets. 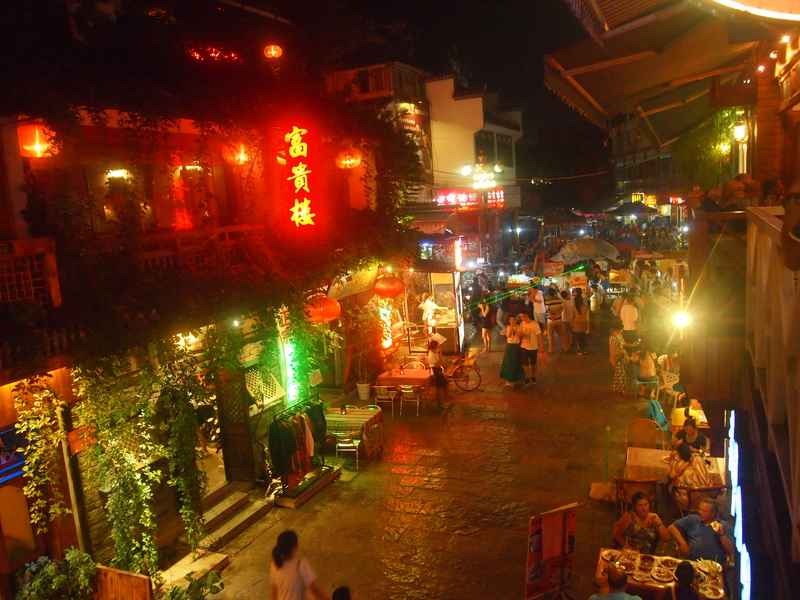 There are also plenty of tourists, including Chinese families, Western backpackers and older couples. 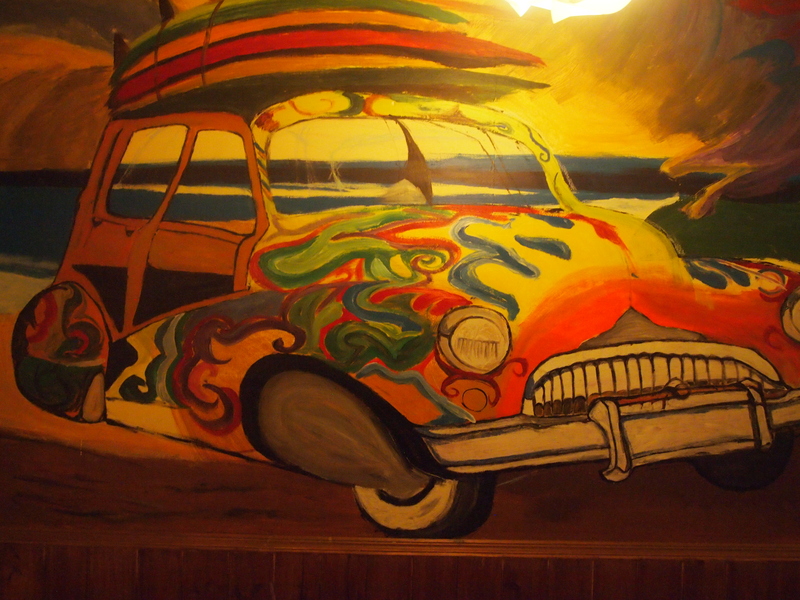 To stroll through the town, click on any of the pictures below for a full-sized slide show. In my walk about town, I come to a cute pond beside the hugest McDonald’s I’ve ever seen. What a shame about that. I have a picture, but it’s so NOT scenic. I’ll leave it out. I don’t think you’ll miss it. I stop at Cloud 9 for lunch. By this time, I’m starved. 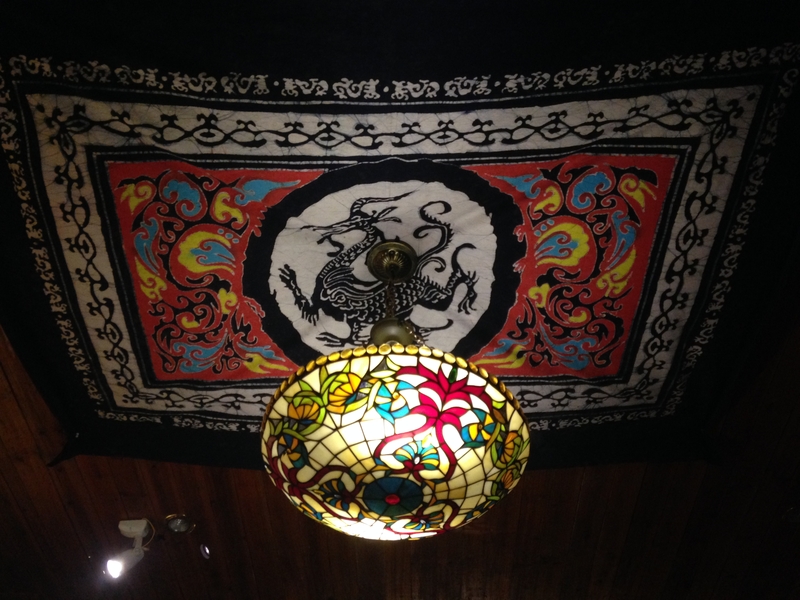 I order shrimp with peppers and onions on a sizzling plate, along with white rice and a beer. It’s yummy, but my stomach starts rumbling before I’m even finished eating. Since I feel a little sick, I go back to the hotel to relax a bit before going back out for dinner. I got up at 5 a.m. this morning just to be sure I made it to the train in time, so I’m exhausted from travel. After I rest a bit, I go back out and walk along the river. Along the opposite side of the road from my hotel, between the hotel and the Li River, is a long playground buzzing with Chinese children. 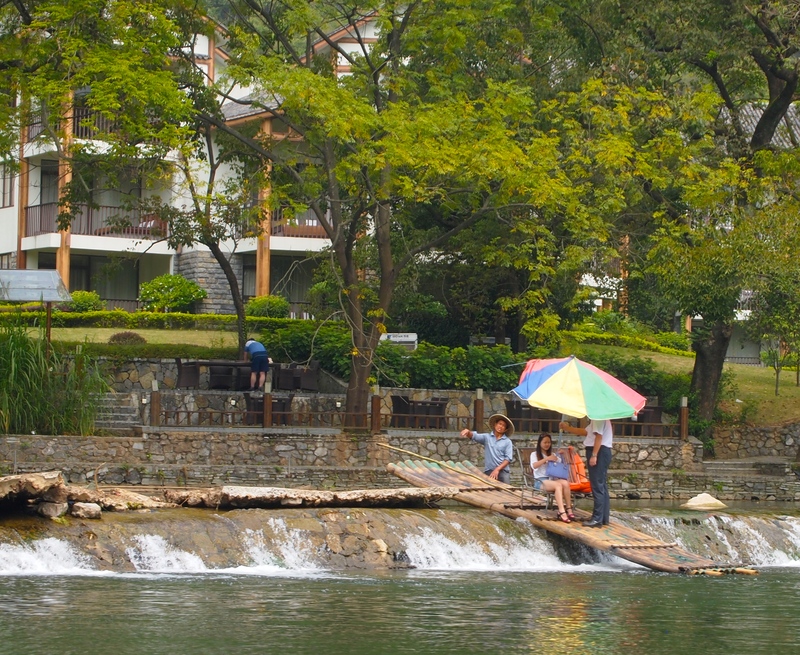 Down by the river are lots of people posing for pictures on a sliver of moon, or walking along the river’s edge and on stepping-stones that jut into the water. I wander back into town. It’s even more crowded now that it’s approaching dinner time. 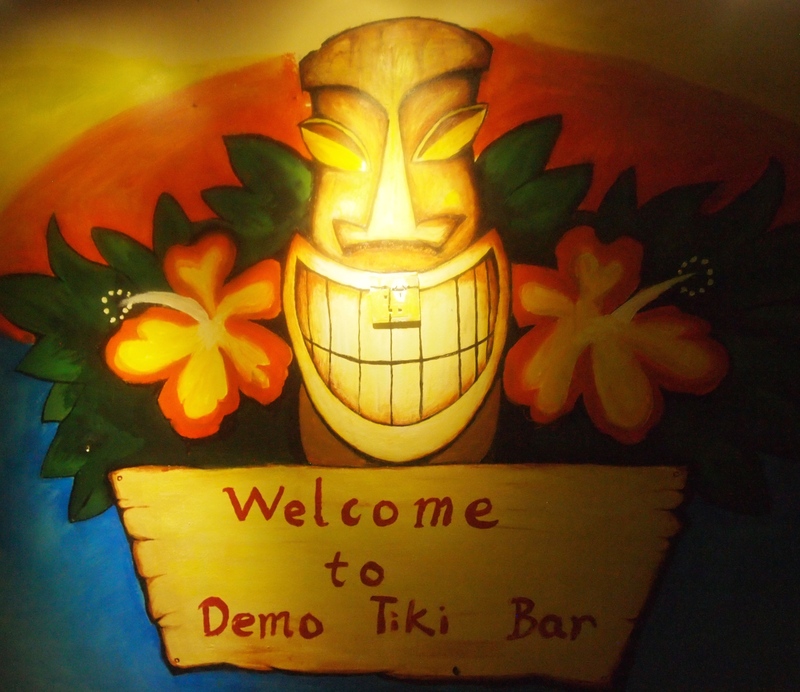 Of course, I haven’t got the lay of the land yet, so I have no idea where to find Demo, but suddenly in my wanderings, there it is right in front of me. I’m not hungry since I had a late lunch, but I order a Kirin beer and some delicious mushroom soup and homemade bread made by the German cook, Peter. I chat with Audrey a while and then she gets to work. We plan on taking a bike ride on Saturday. 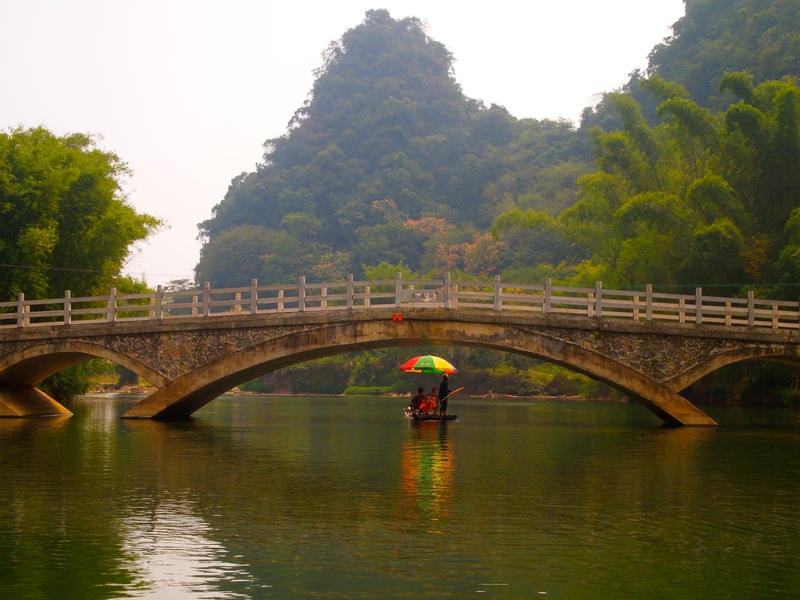 Saturday, September 20: My student assistant, Angela, goes above and beyond the call of duty this morning when she offers to help me get train tickets from Nanning to Guilin for the upcoming National Holiday on October 1-7. 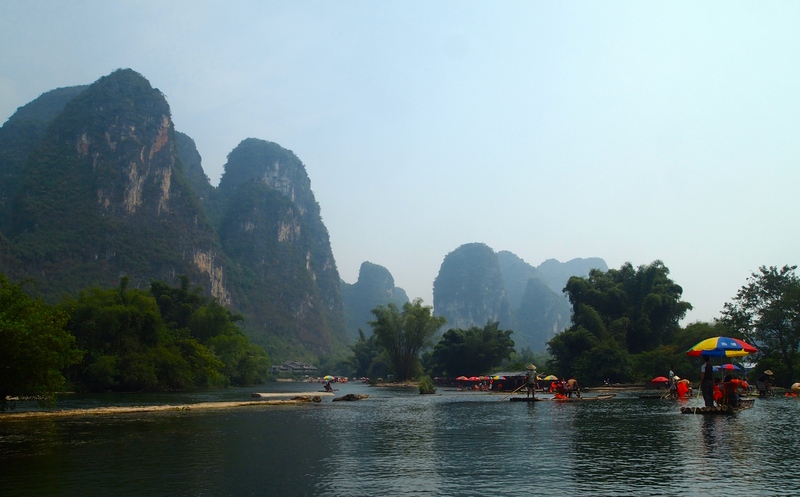 My ultimate destination is Yangshuo, where I will be in the middle of some of the most beautiful scenery in the south of China. 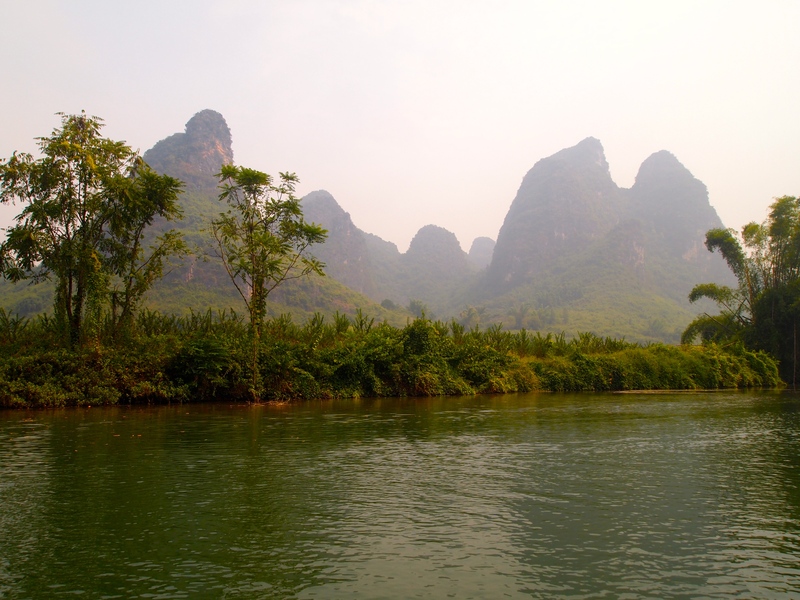 The niece of a former classmate of mine lives in Yangshuo; Audrey has offered to meet me in Yangshuo. 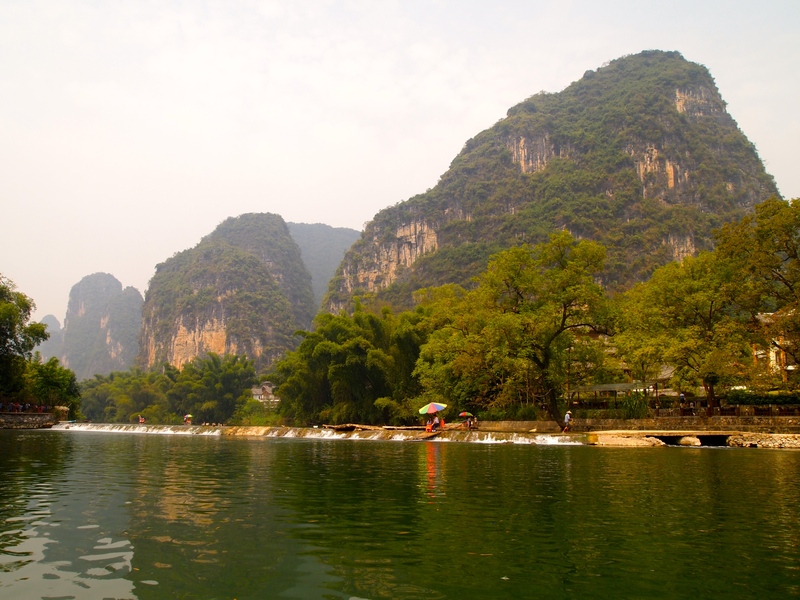 She even has gone so far as to offer to let me stay with her, but as I enjoy my privacy, I have decided to get a hotel in Yangshuo. It will be outrageously crowded during the National Holiday, and I’m fully prepared for that. It’s the only extended holiday I have until February, when I have about 5 weeks off, so I must take advantage of this time to travel, even if the rest of China will be coming along on my journey. 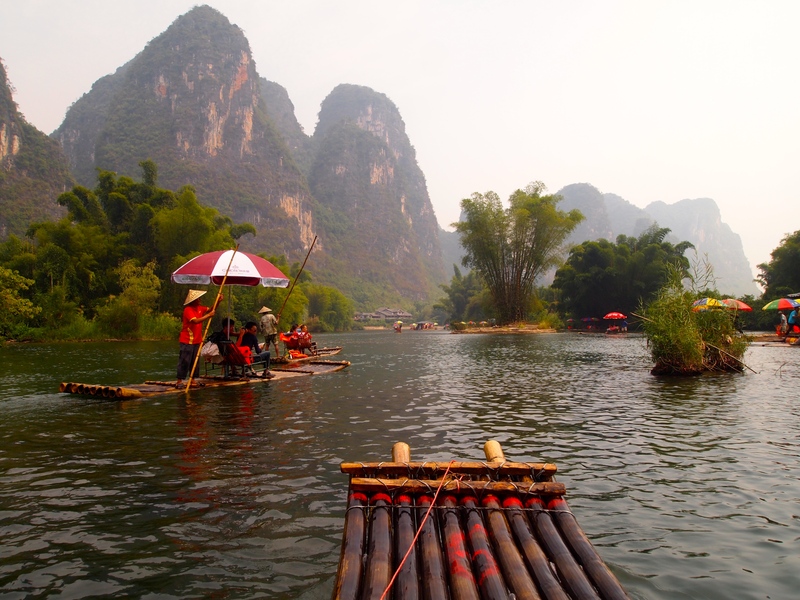 I’ve communicated with Audrey through Facebook and by WeChat, and she tells me while in Yangshuo I must take the boat ride down the Li River, and I also should visit Xingping, the picture of which is on the back of the 20 Yuan bill. 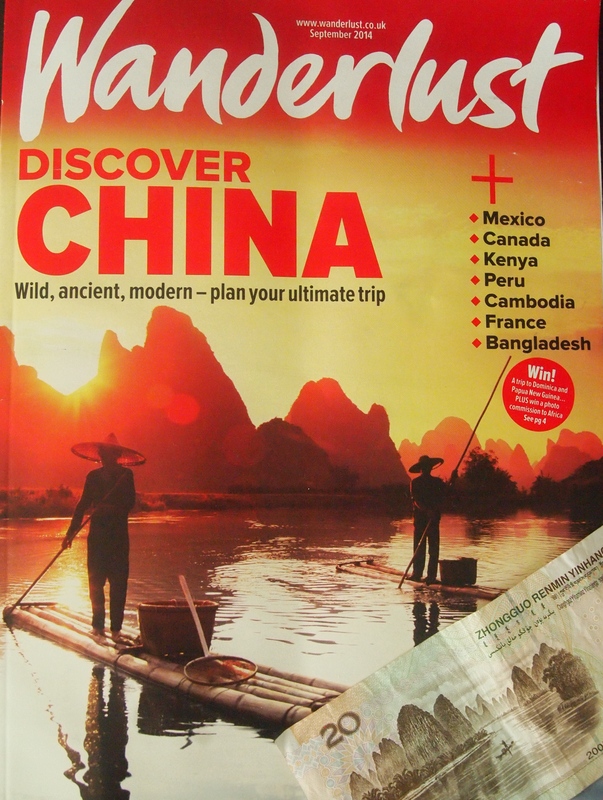 The September 2014 issue of Wanderlust & Xingping on the back of the 20 yuan bill. I’m excited about my trip, but also nervous, especially because of the crowds that I’m likely to encounter everywhere. 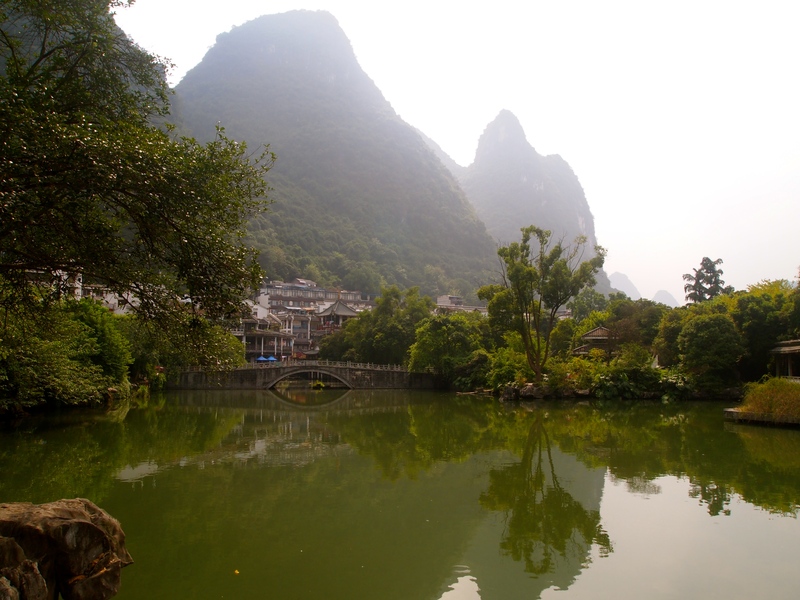 As this is my first time traveling in China alone, I’m worried about not being able to communicate, not catching my train on time, not being able to get a bus to Yangshuo, or not having the proper documents I need for travel. On September 17, three of us teachers who need a resident visa were escorted to the police station, where we had to turn over our passport, medical results and the application for the resident visa. All of us believed when we went there that we’d have our passports back from the police by October 1. After all, the police had nearly 2 weeks to get our documents back to us. However, we were all shocked and upset that our passports would not be returned to us until October 13, well AFTER the National Holiday. One of the teachers had already bought a plane ticket to Indonesia for the holiday. The university administration had full knowledge of her plans, and had even allowed her to rearrange some of her classes. When this teacher found out our passports wouldn’t be returned until October 13, she took her passport back and said she would not turn it over to the police. As we don’t have multiple entry visas in our passports at this point, she wouldn’t be able to return to China. This created some very tense moments. The other teacher and I have plans to travel within China, but this is also problematic as hotels always require a passport. The police assure us that within China, all hotels, trains, etc. are required to accept a copy of our passport and the receipt issued by the police as identification. We’ve heard mixed stories about this from teachers who have been here awhile. 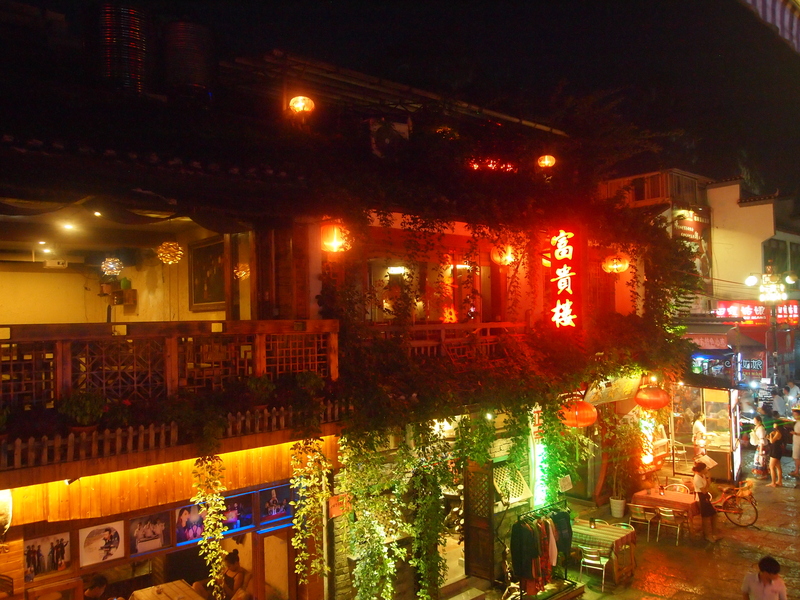 It makes me nervous, but at least I do know Audrey in Yangshuo and she has offered me a place to stay if I have a problem. Hopefully I won’t be sleeping on the sidewalk. Today, when Angela comes to help me get my train tickets, she’s surprised to find that I don’t have my passport. She tries to book the tickets online, on a Chinese-only website 12306.cn. But then she finds out that she needs my actual passport to book online. She makes a phone call to see if she can buy my ticket at a ticket office right outside the main gate of the university and she explains the situation. They tell her we must go to the train station to buy the ticket if we don’t have the original passport. So we get on the bus and head to the train station where every queue is about 30 people long. First we stop at an information booth, where Angela has to fight her way to the front as there is no queuing here. She’s told to go to the English-only ticket line and talk to them. We go wait in line. And wait. And wait. What I don’t understand is why these non-English speaking Chinese are in the English-only ticket line! 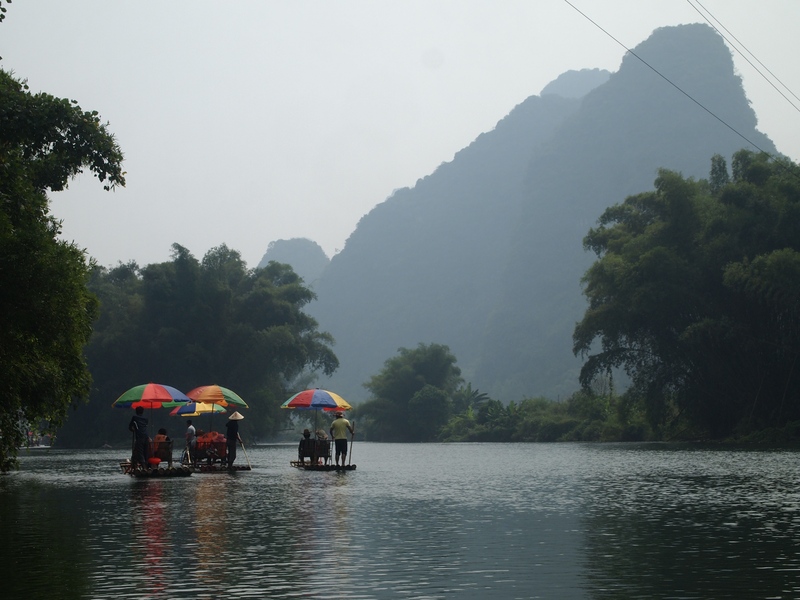 When I get to the front of the line, the ticket person tells Angela that she cannot sell tickets for Guilin until 3 days before the date of travel. As I want to travel on October 1st or 2nd, it’s too early for her to sell the tickets. However, she says there is a way around this. Angela can buy the tickets by phone and then pick them up at the ticket office within 24 hours. We’re not sure at this point if I have to come back to the train station or if I can go to the ticket office directly across from the front gate of the university. All of this takes several hours in the heat and humidity, as of course, no place is air-conditioned. 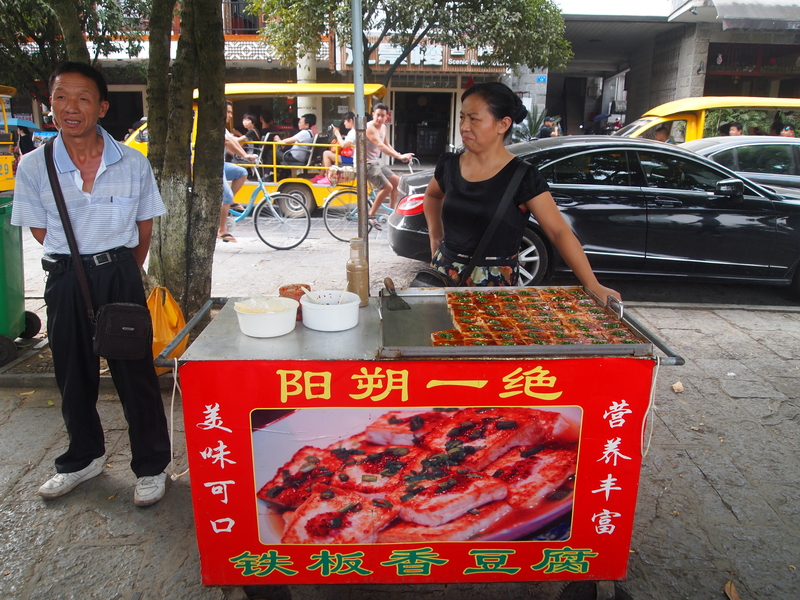 Angela and I agree to go by bus back to the university, where I’ll treat her for lunch at my favorite dumpling restaurant. We enjoy a leisurely lunch at my expense. She deserves to be treated for all her patience in dealing with my dilemmas and for spending half of her Saturday helping me. Finally we return to my apartment; by this time it’s 2:00. We started this process at 9 a.m. At my apartment, Angela calls the train office and orders my tickets. She tells me I must pick them up by midnight of the 21st since they haven’t been paid for. The round trip tickets will cost me 222 yuan ($36.23). We head back out again into the heat. Angela walks with me to the ticket office across from the front gate of the university, but there is another long queue. I tell her she should go home and relax and I’ll return by myself early tomorrow morning to pick up the tickets. After 5 hours, I still don’t have my tickets in hand! Sunday morning, I go to the ticket office across from the university, hoping they’ll let me have the tickets without having my passport. I have the copy of my passport, my Chinese entry visa, and the police receipt. When I get to the front of the line, I phone Angela and she speaks with the ticket lady. I have already shown her the confirmation number and my documents. For a nervous few minutes, I dread her telling me she can’t sell me the tickets, or almost worst, that I have to return to the train station to pick them up. Luckily it goes without a hitch, and I leave with my two train tickets in hand.